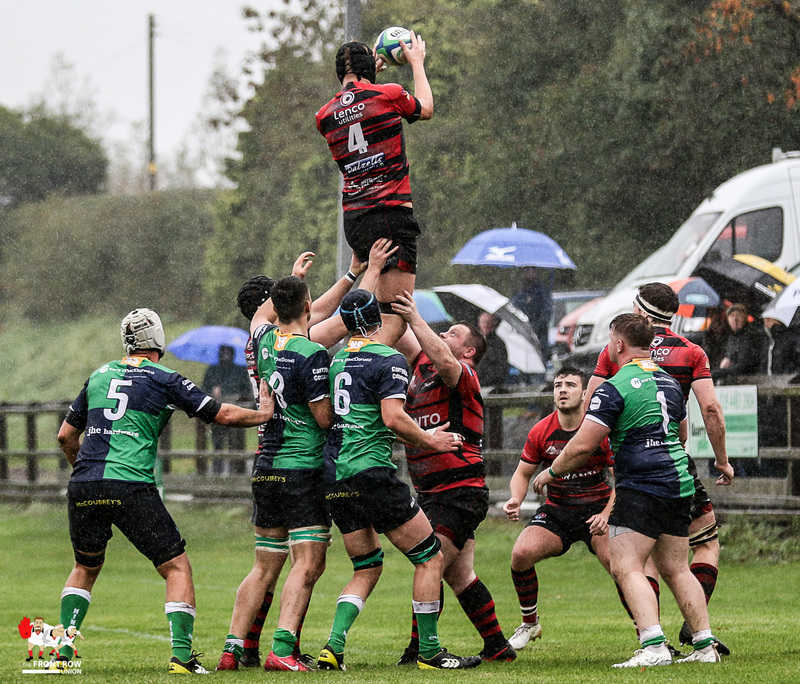 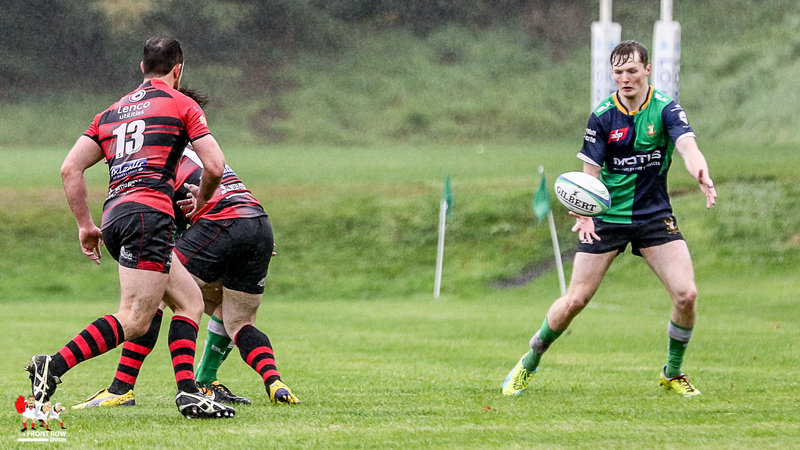 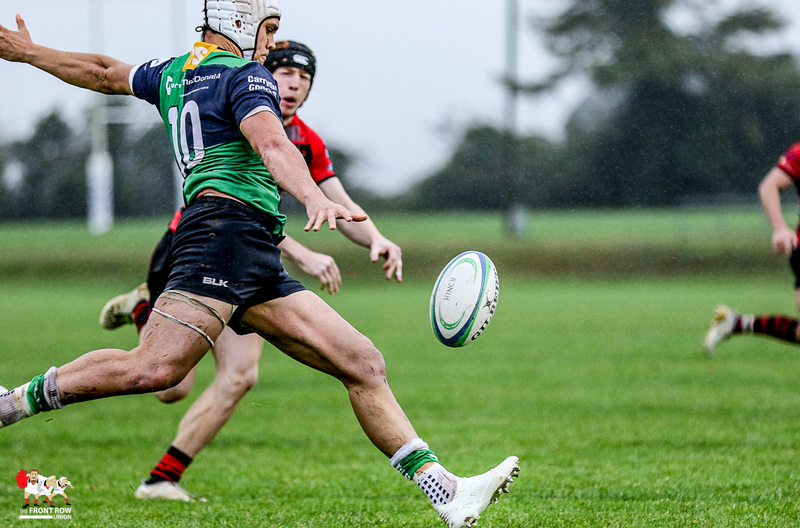 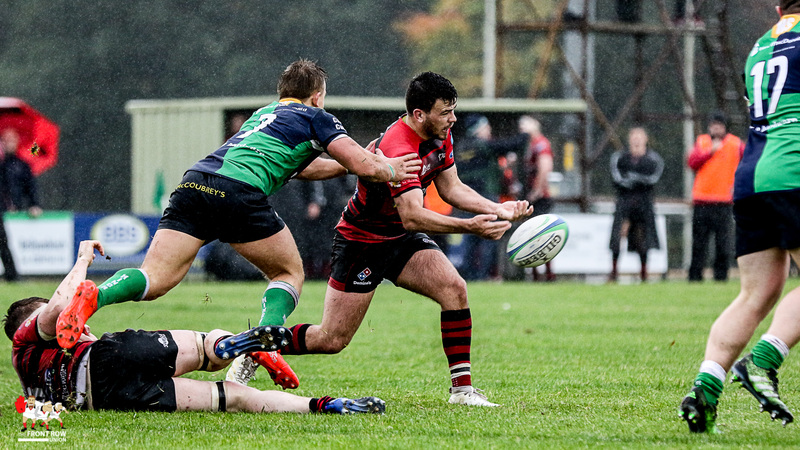 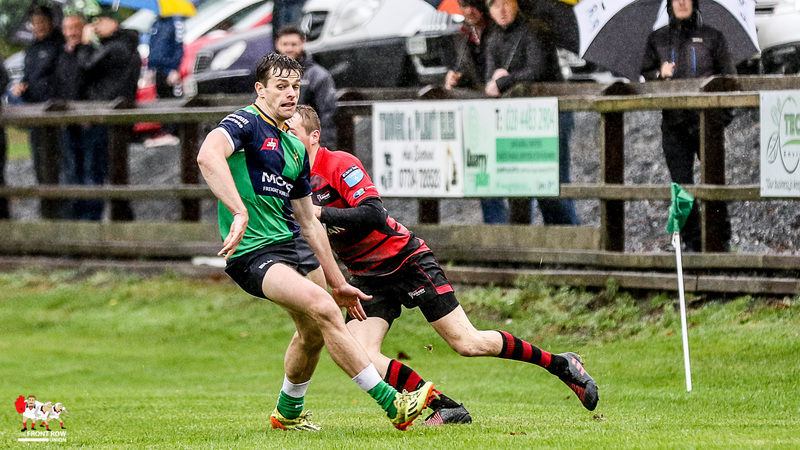 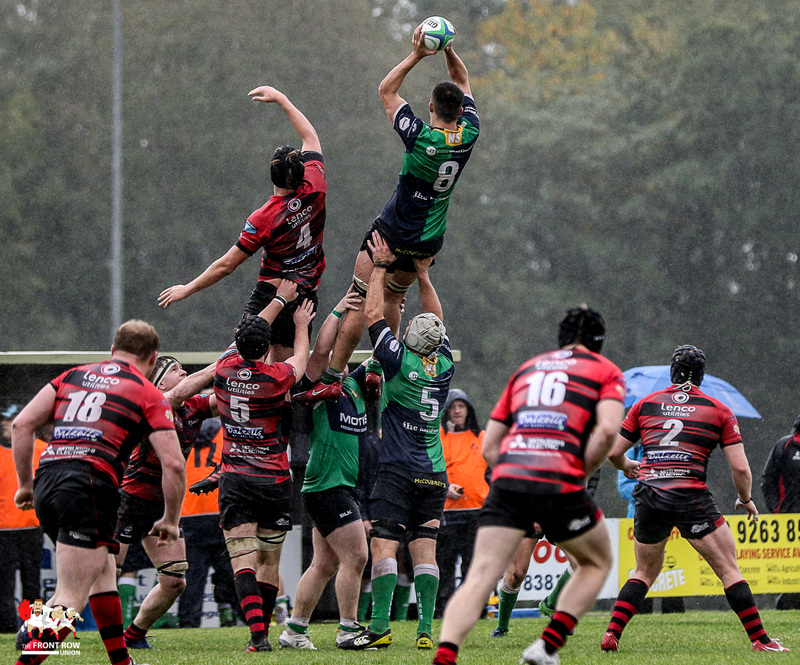 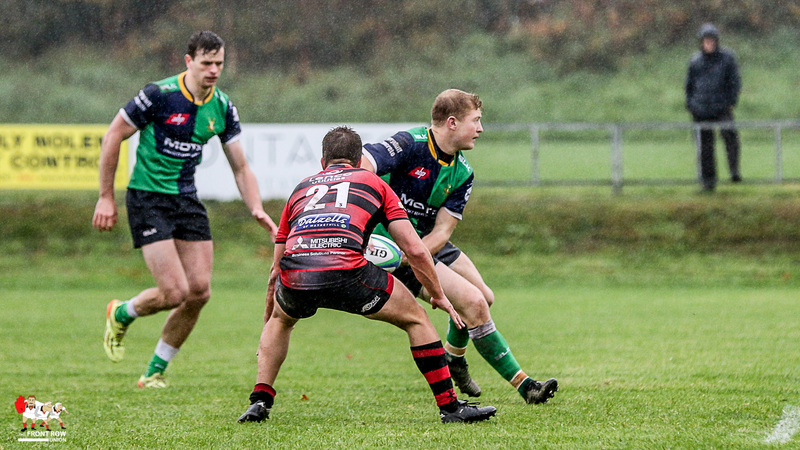 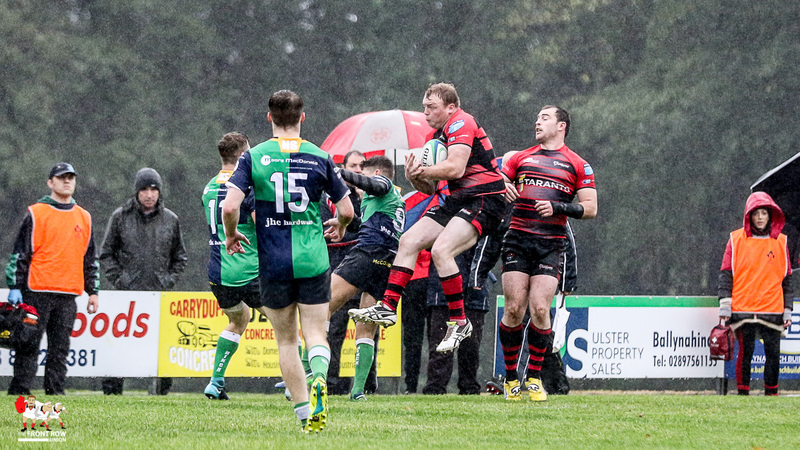 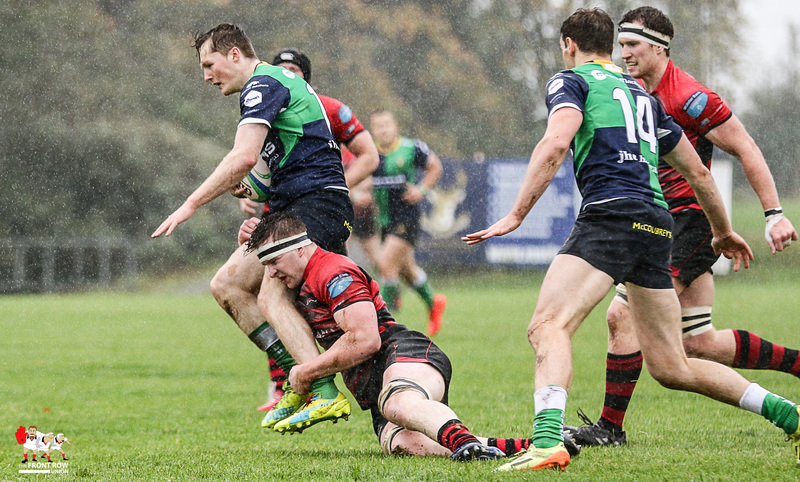 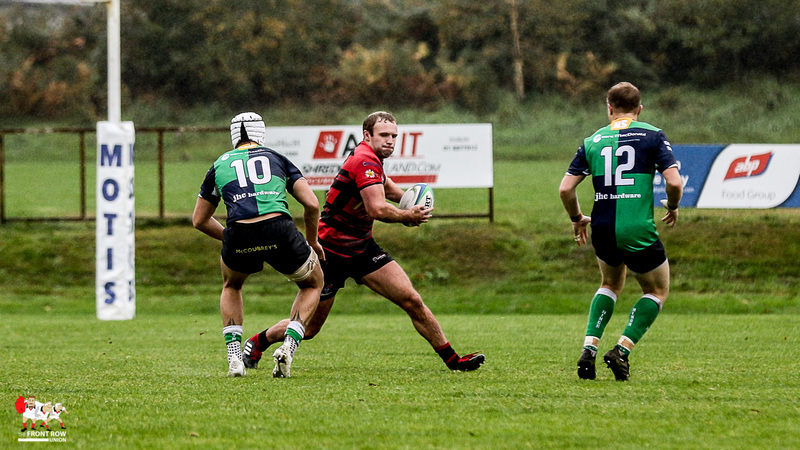 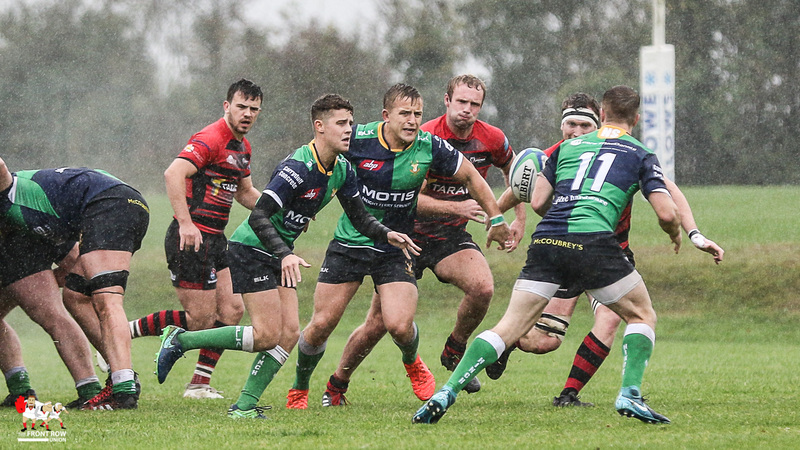 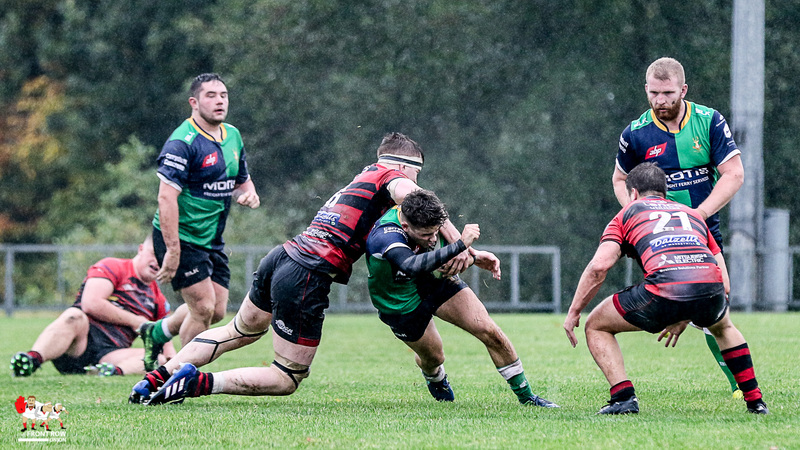 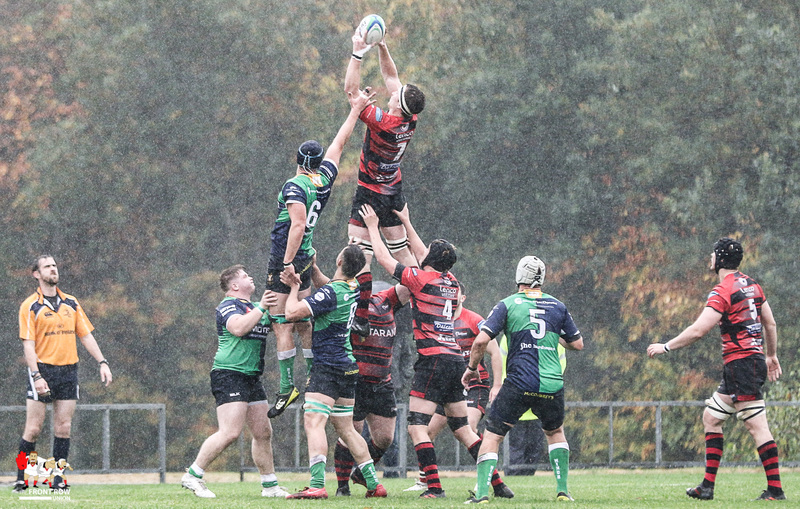 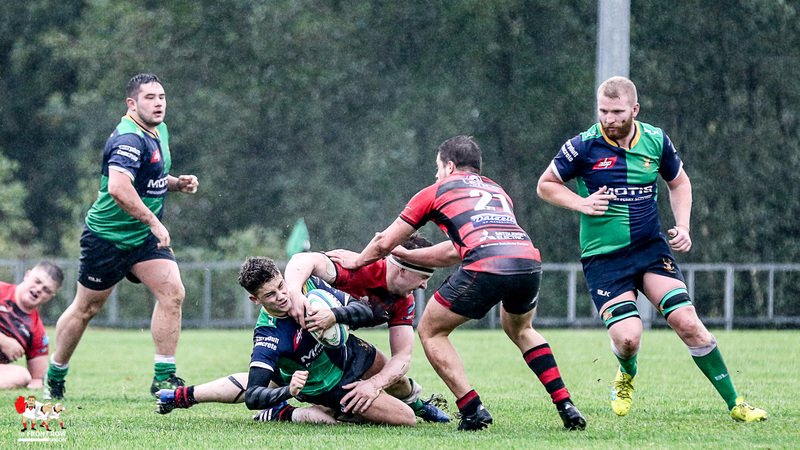 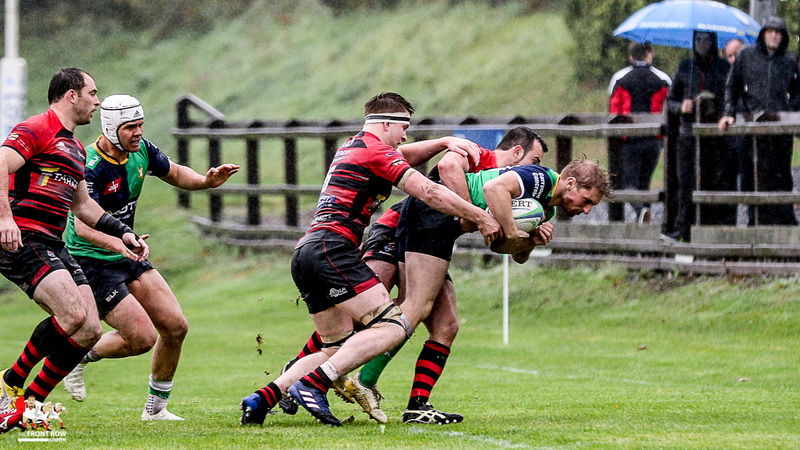 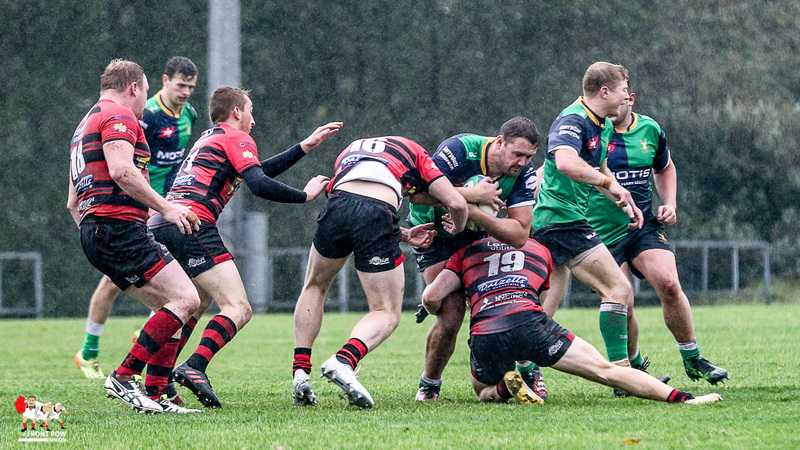 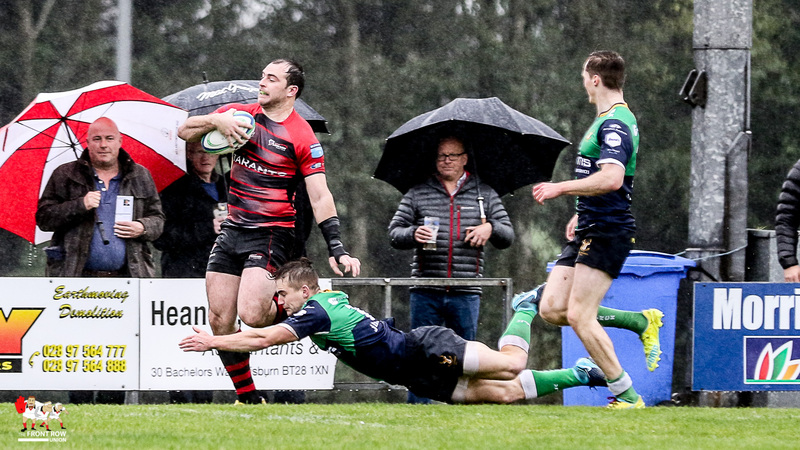 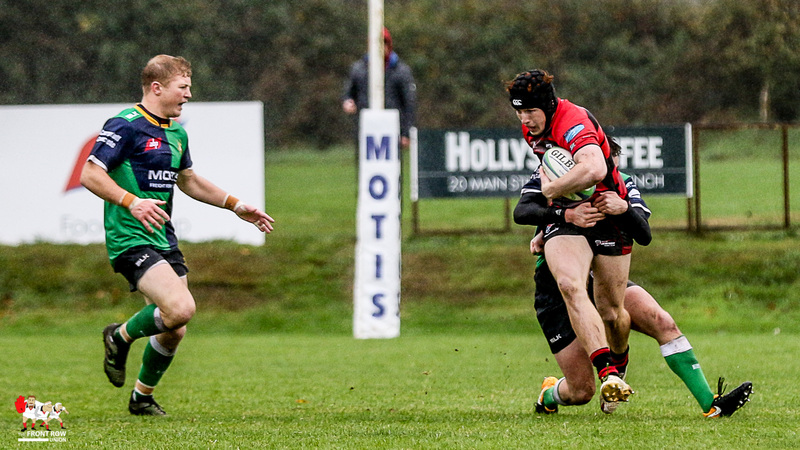 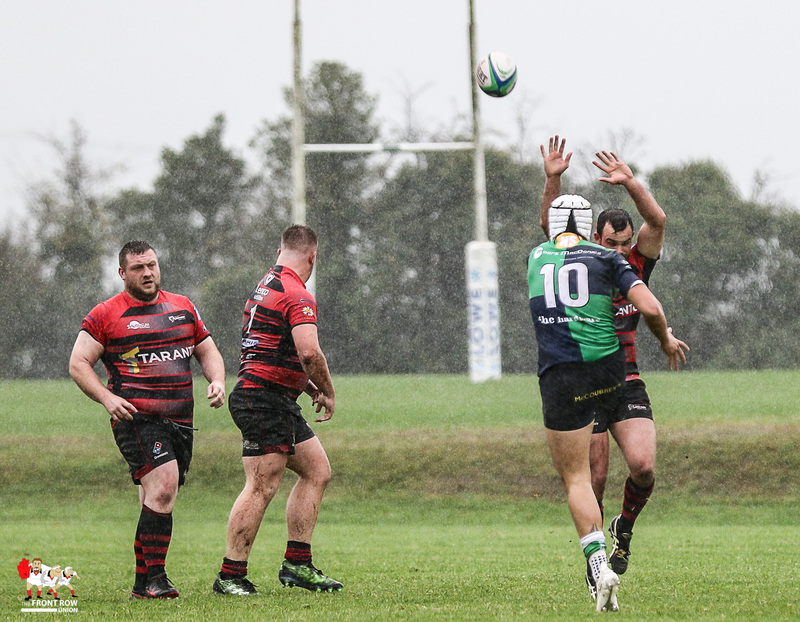 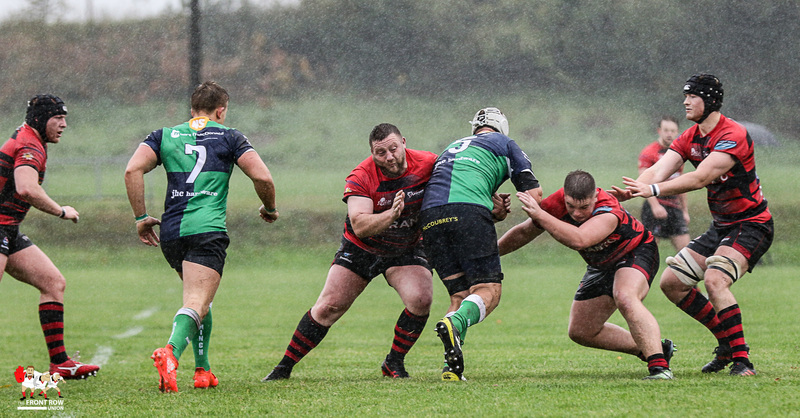 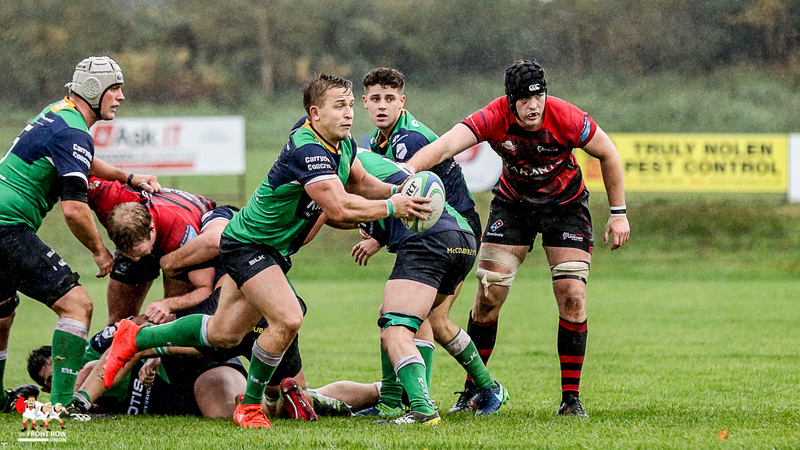 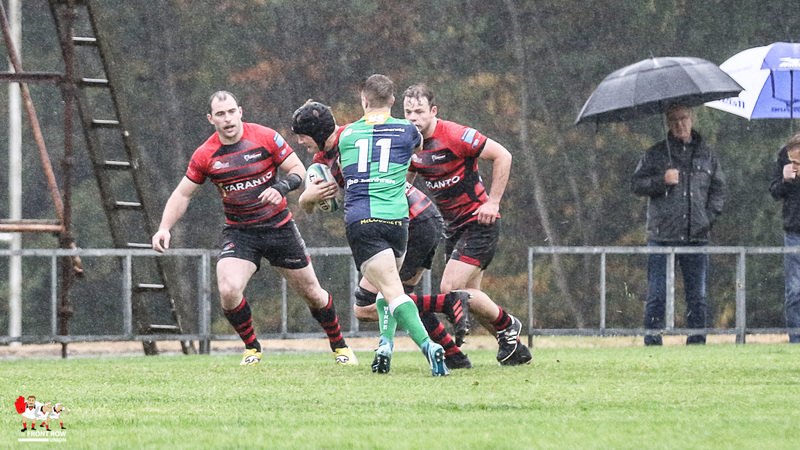 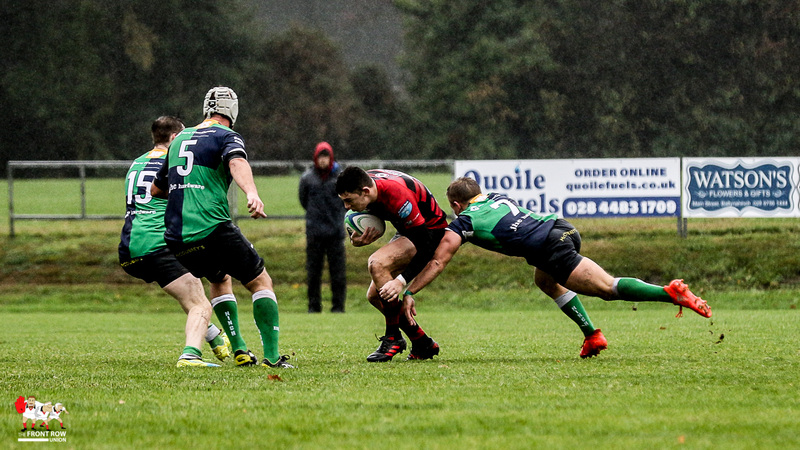 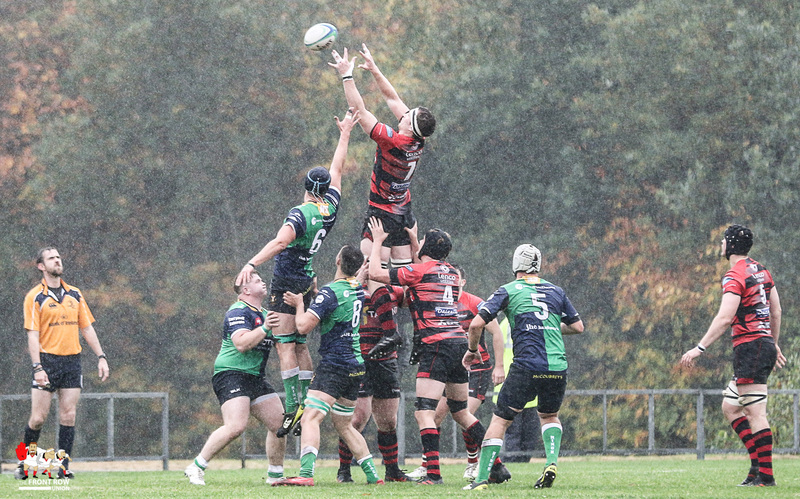 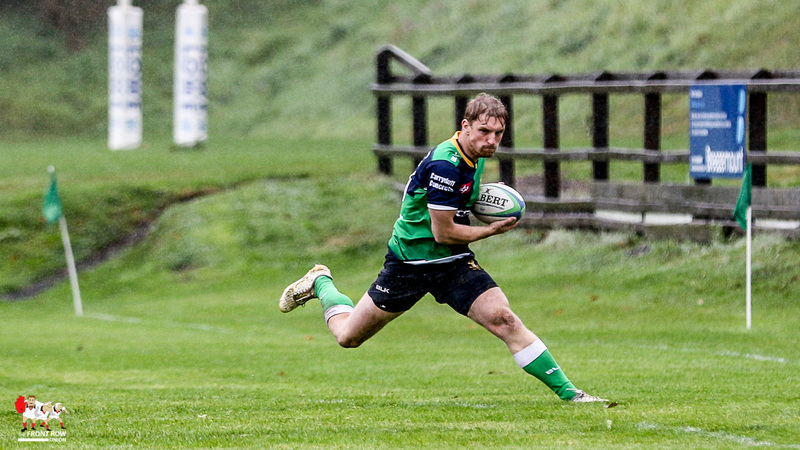 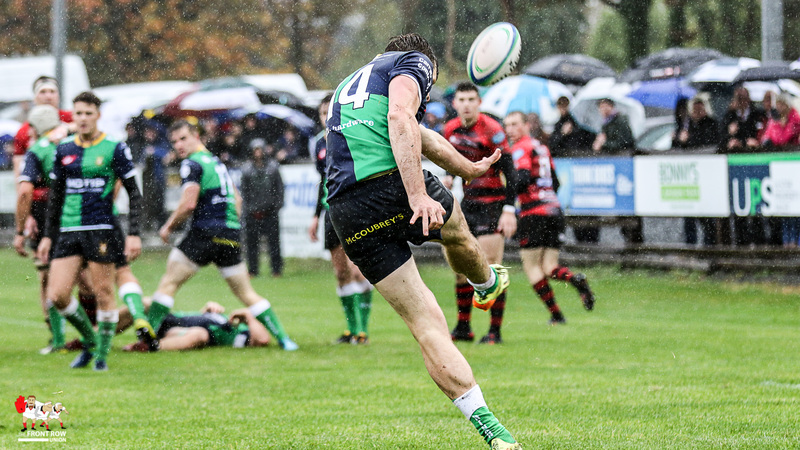 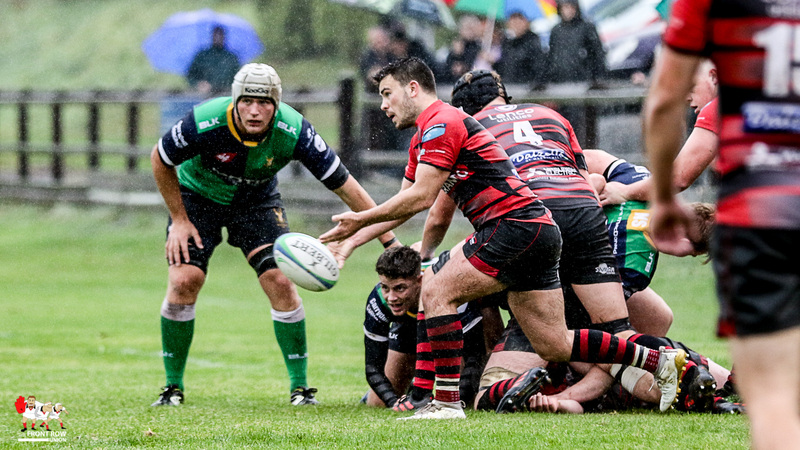 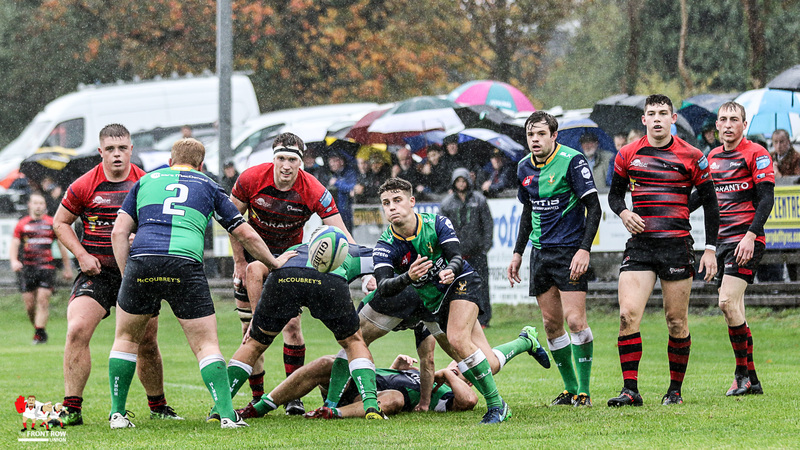 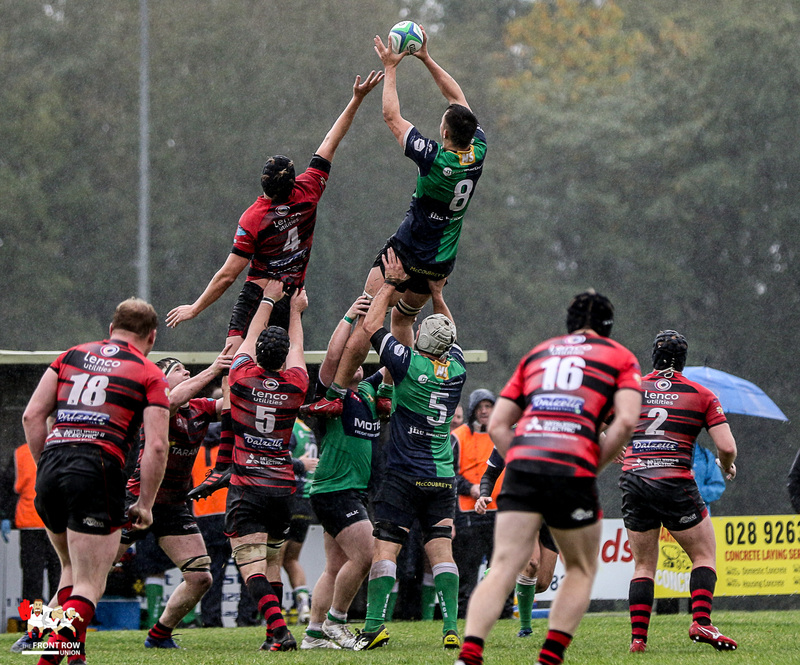 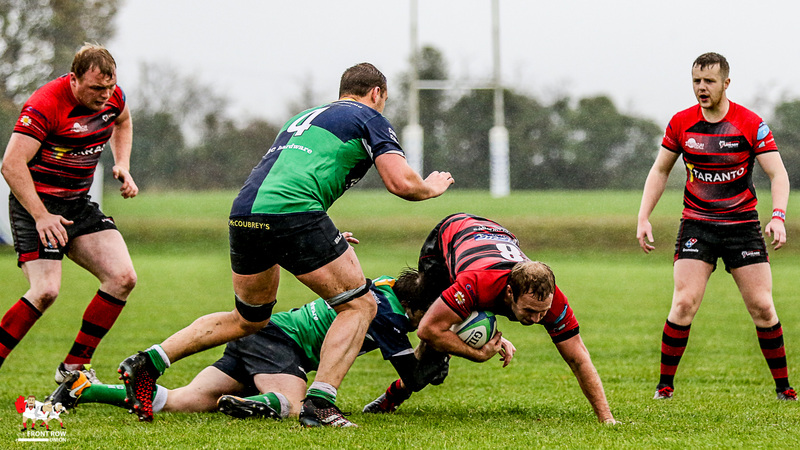 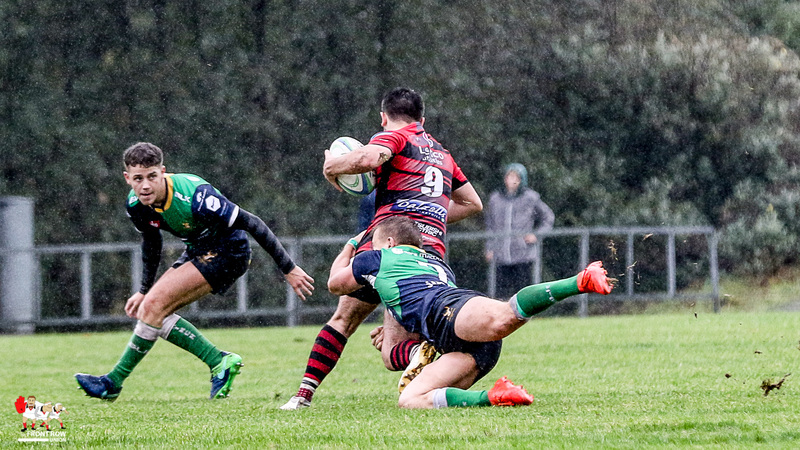 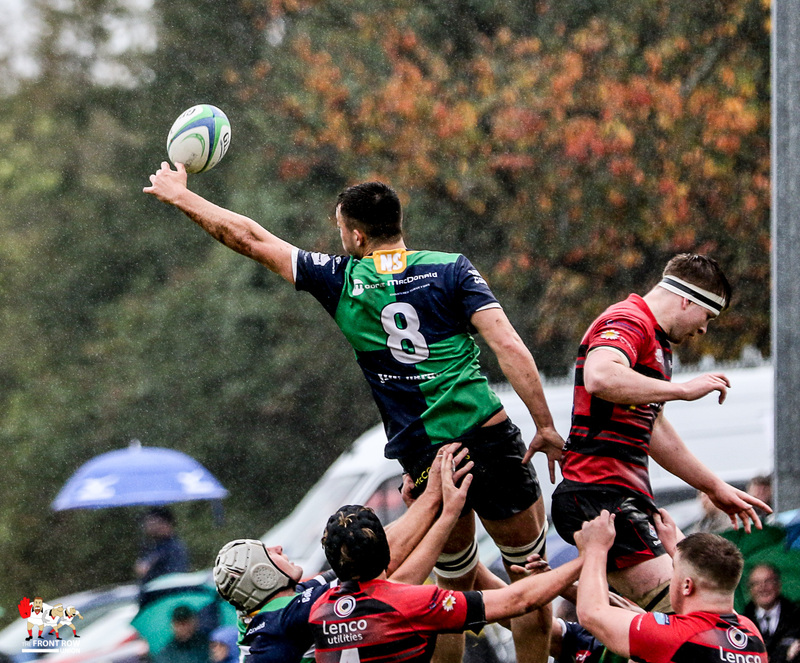 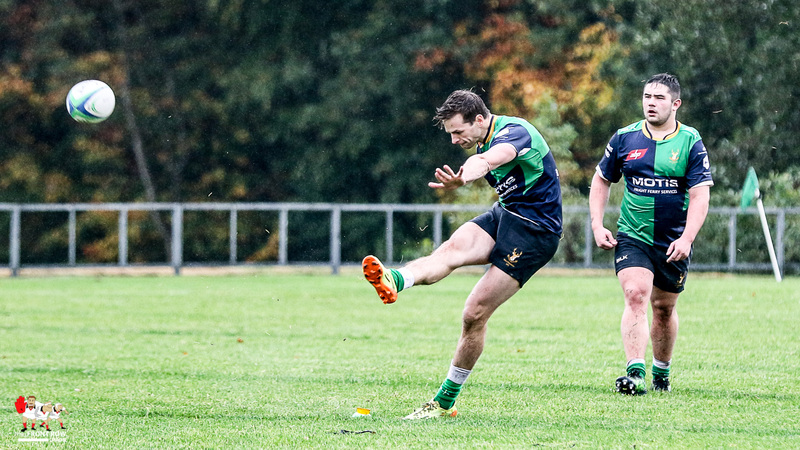 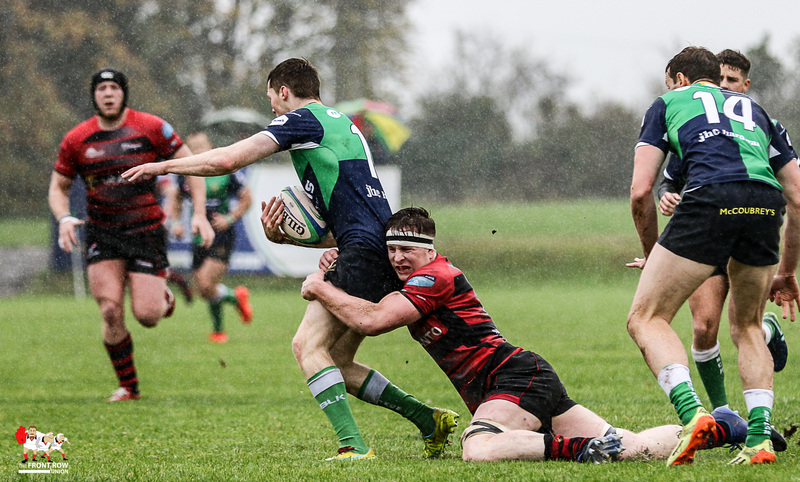 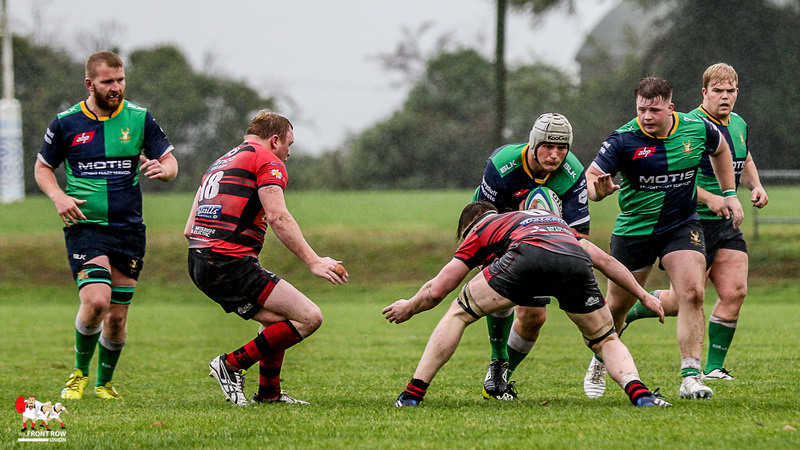 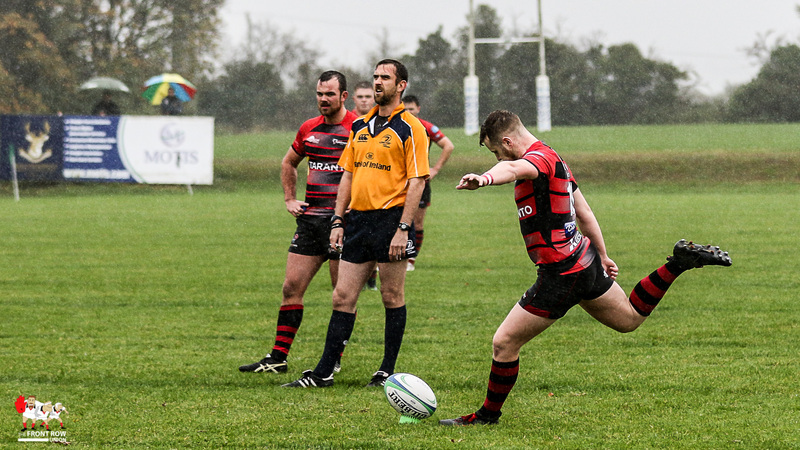 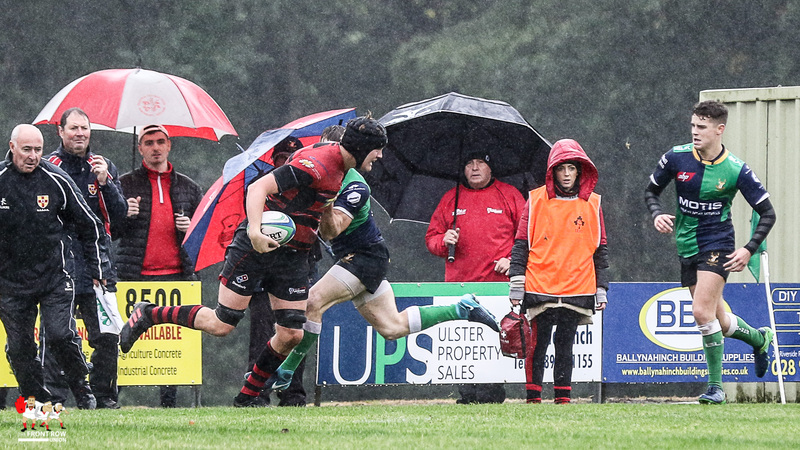 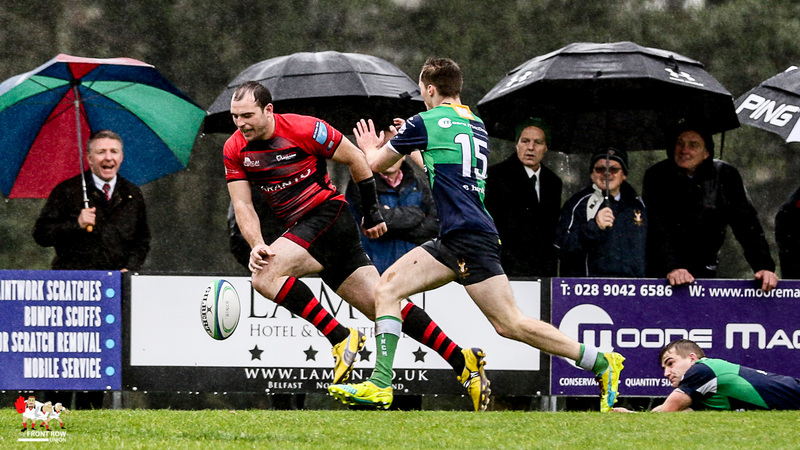 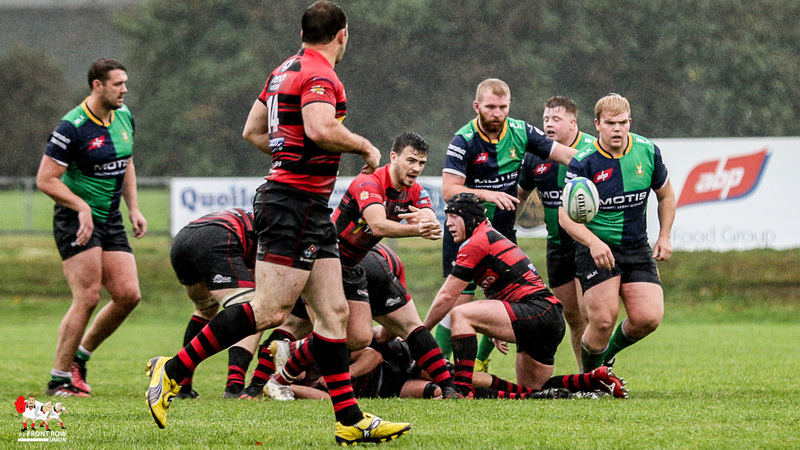 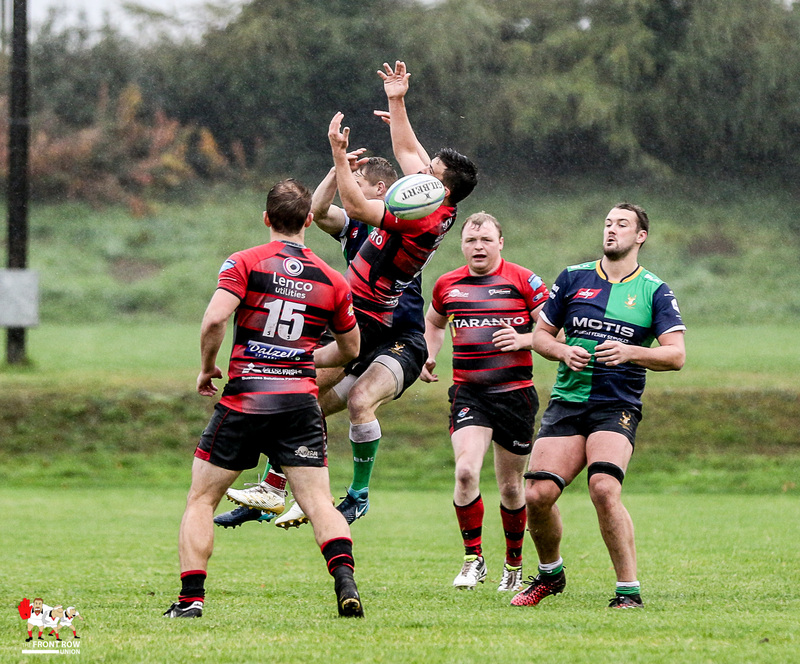 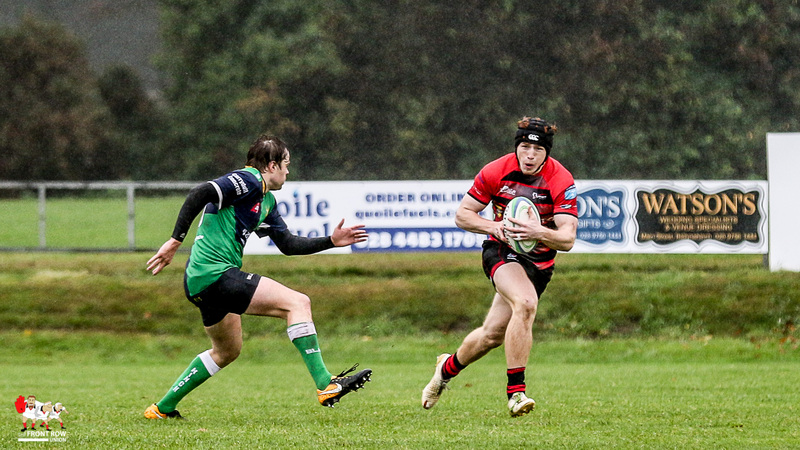 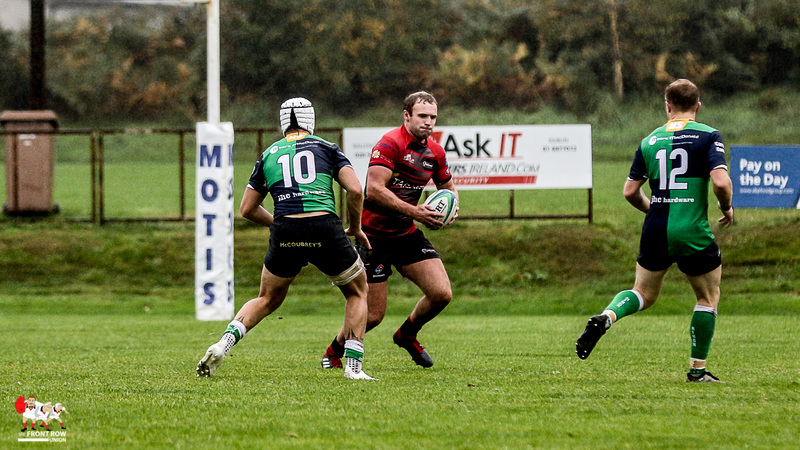 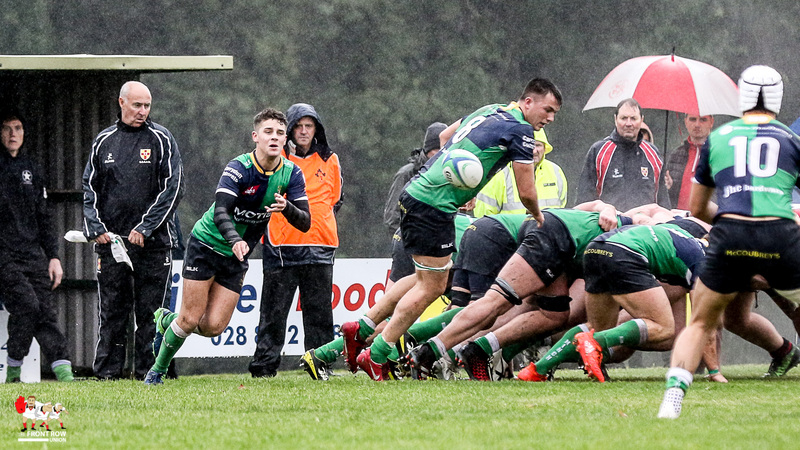 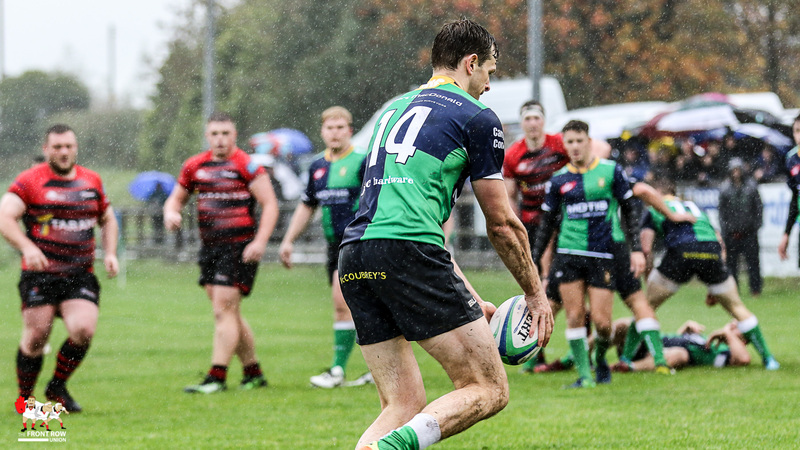 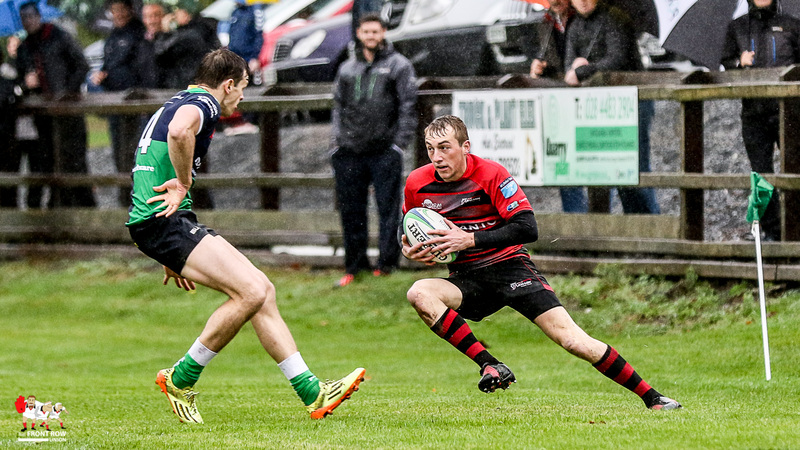 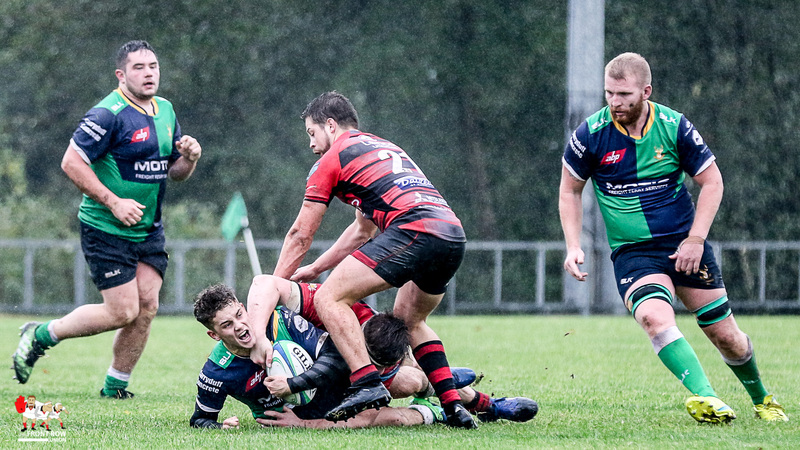 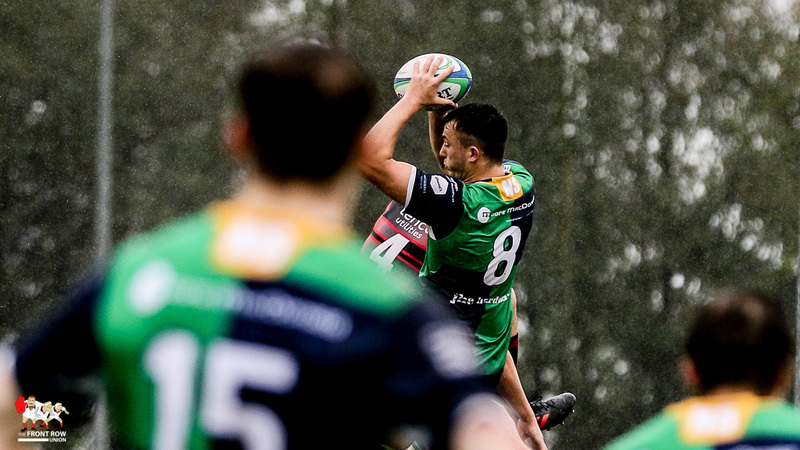 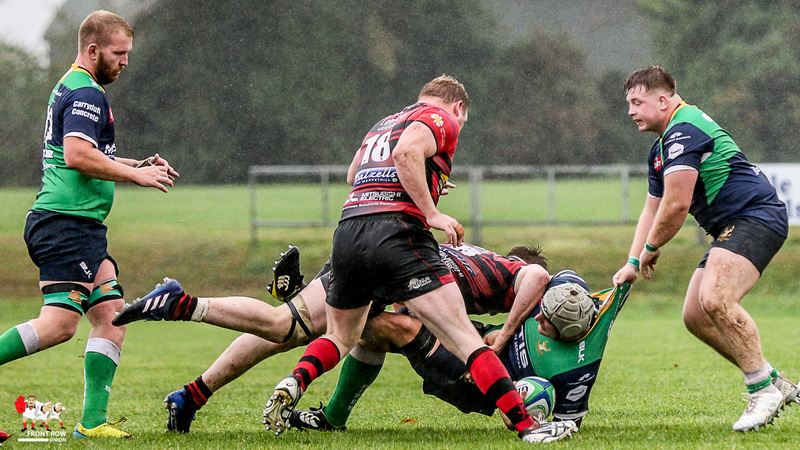 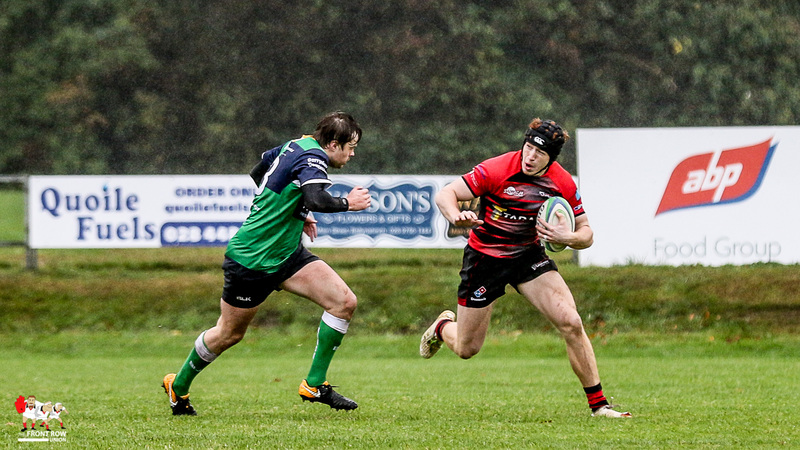 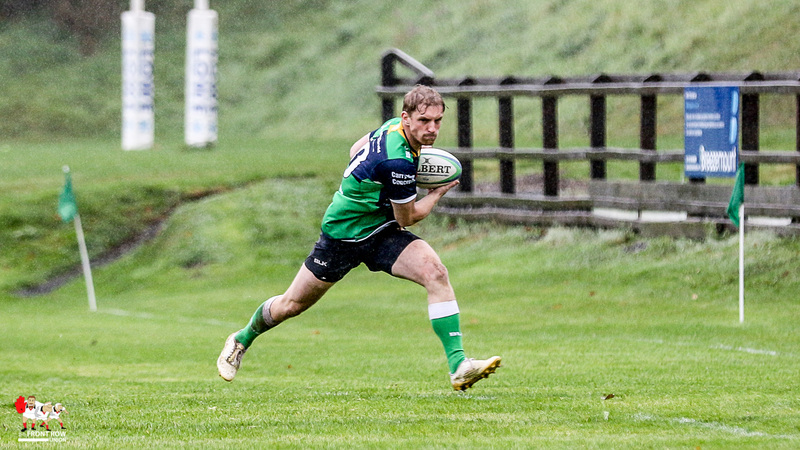 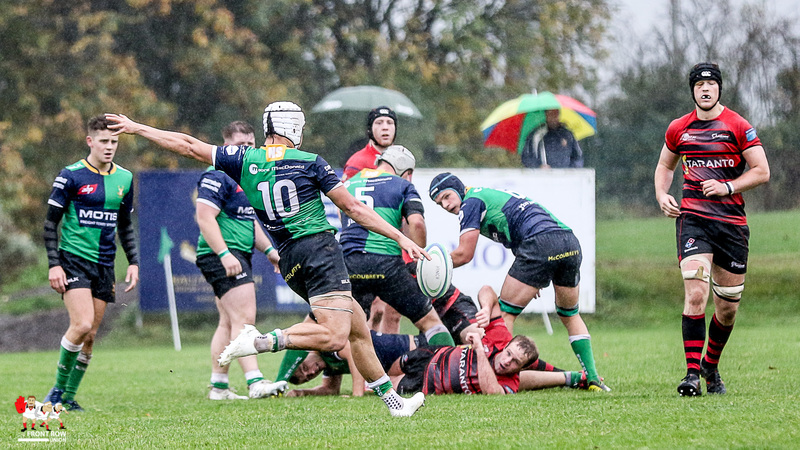 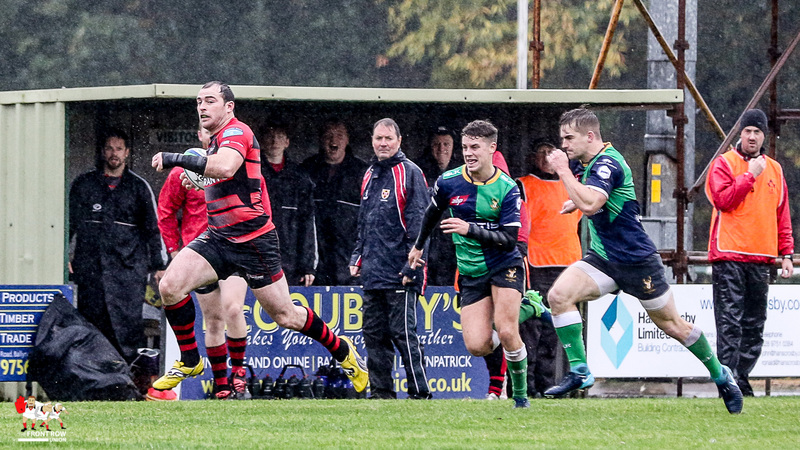 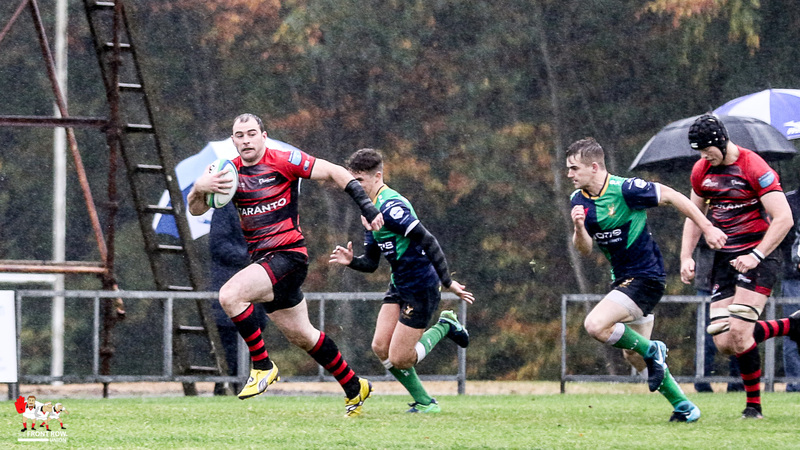 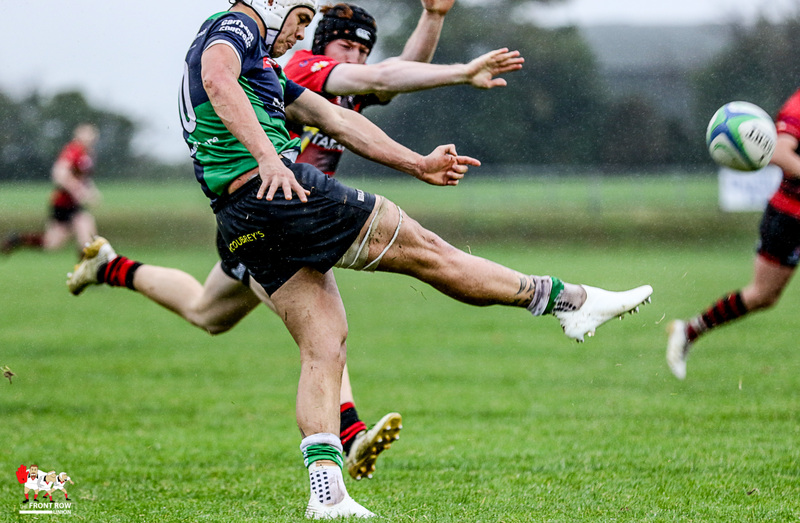 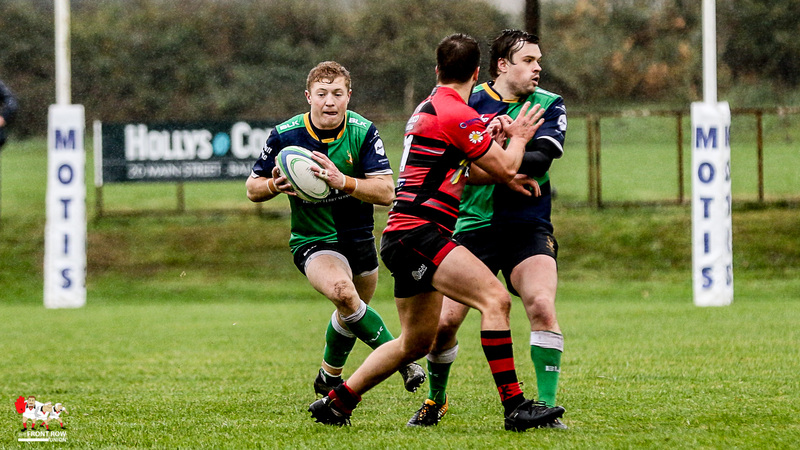 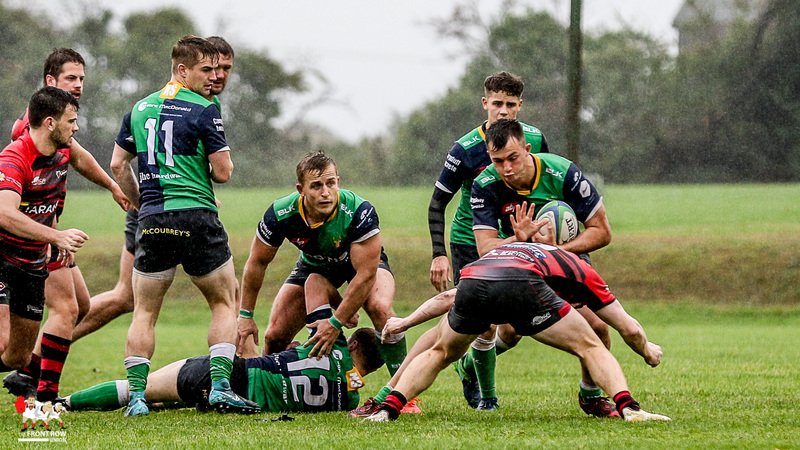 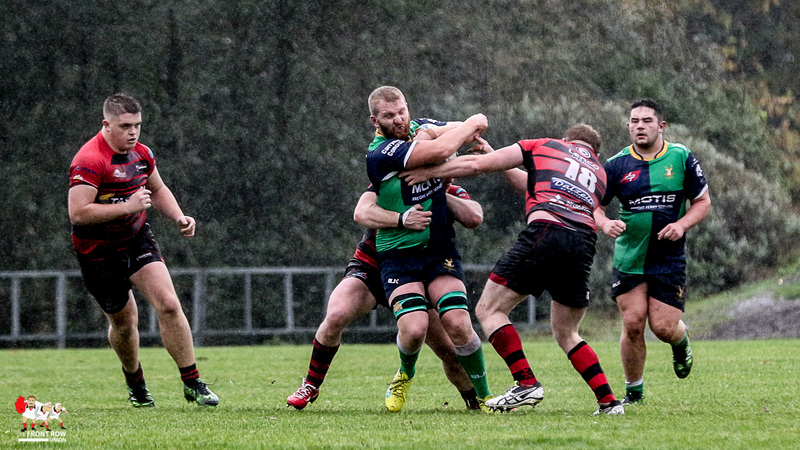 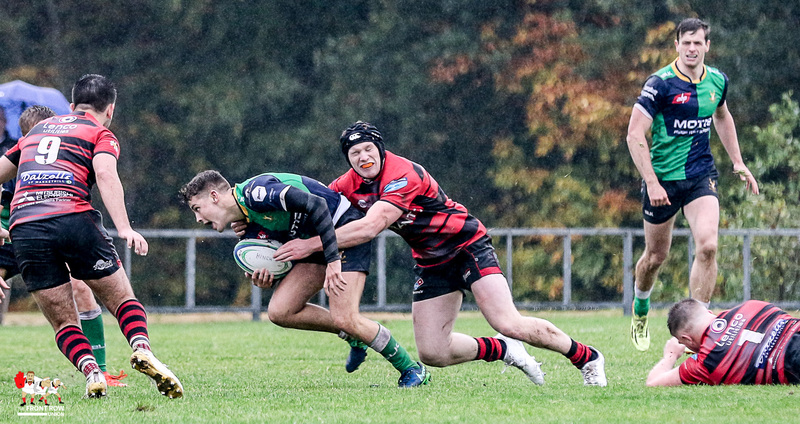 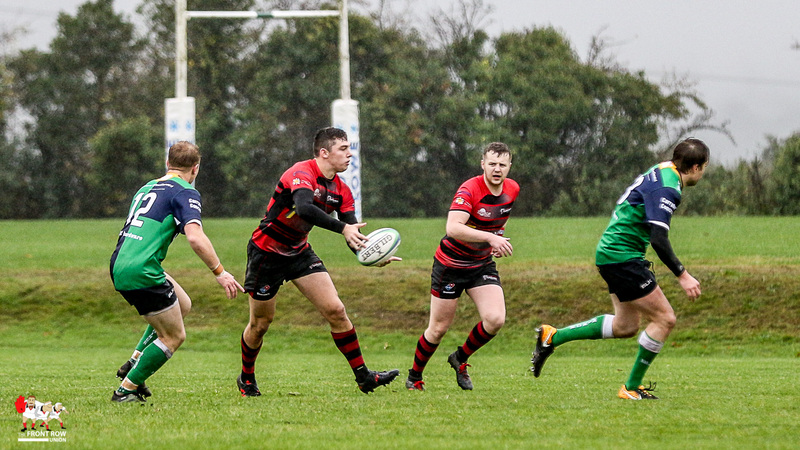 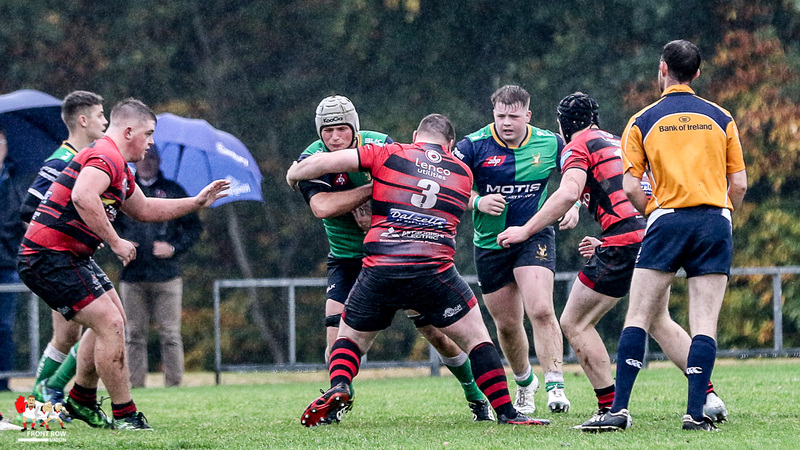 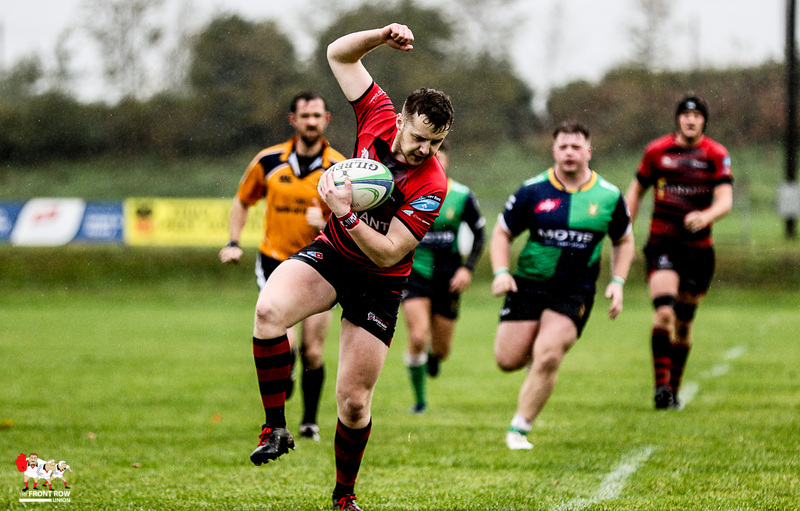 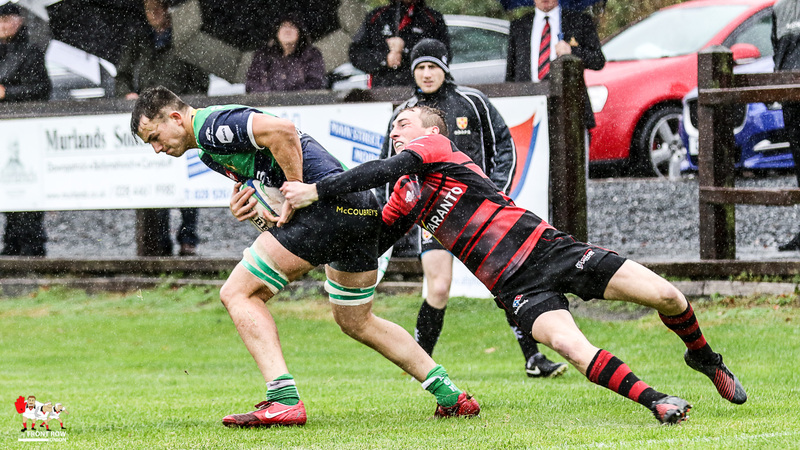 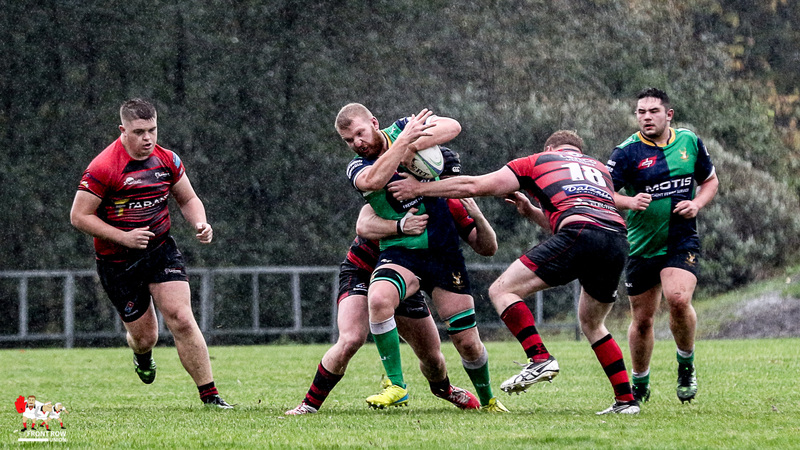 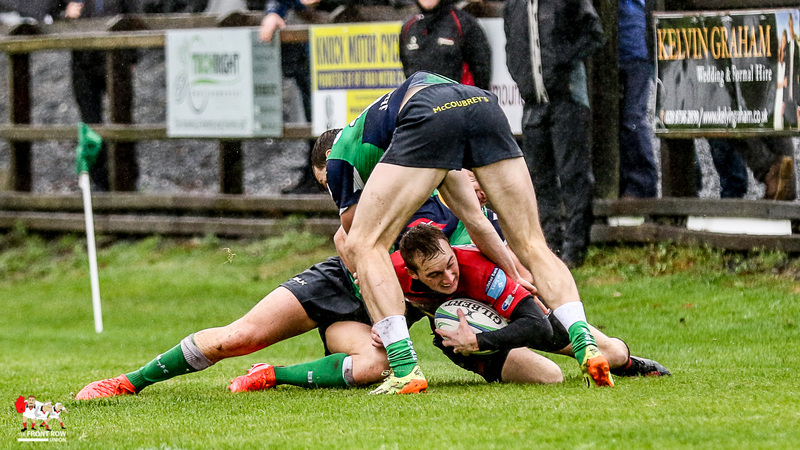 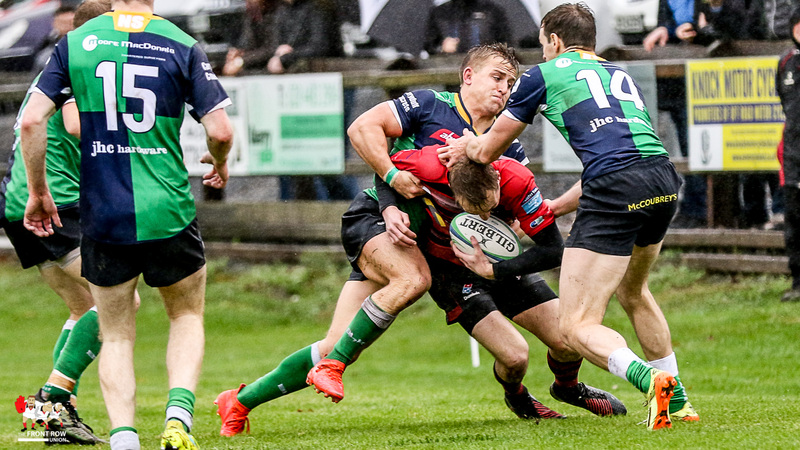 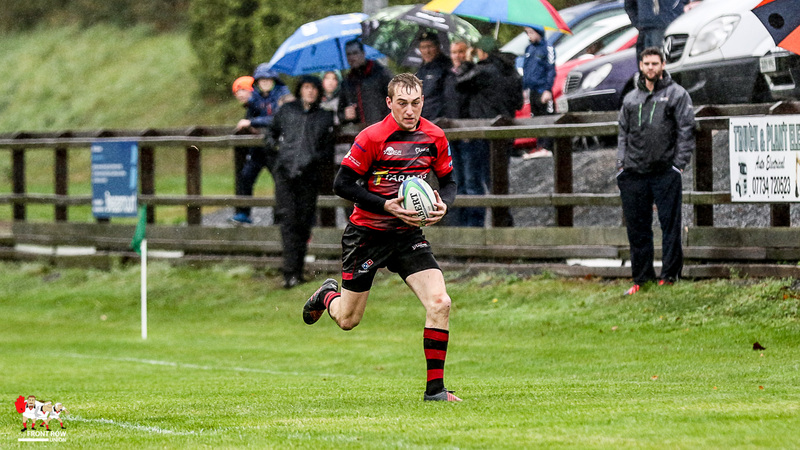 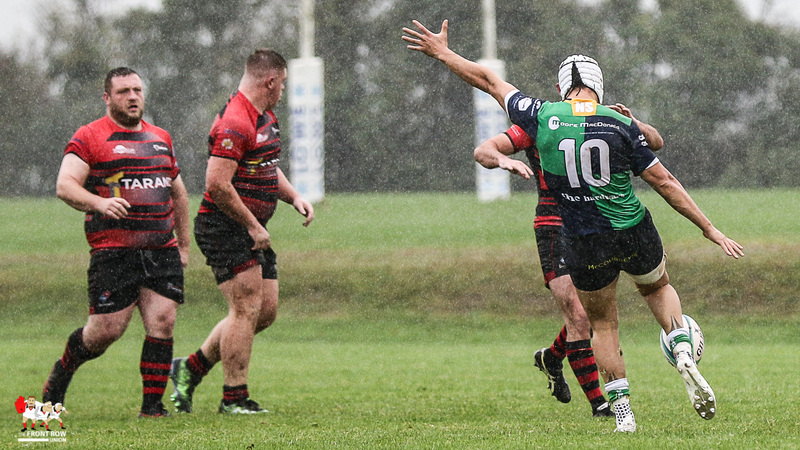 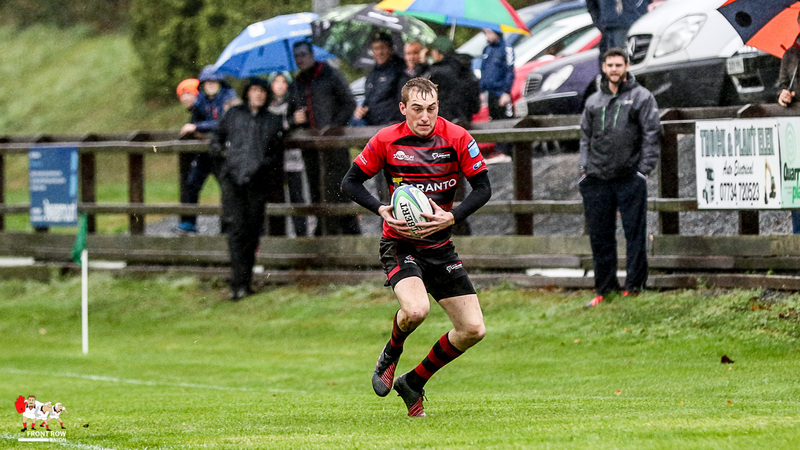 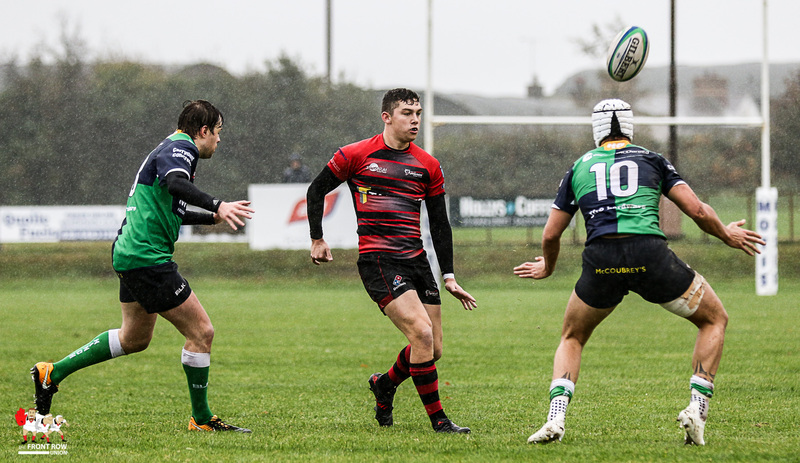 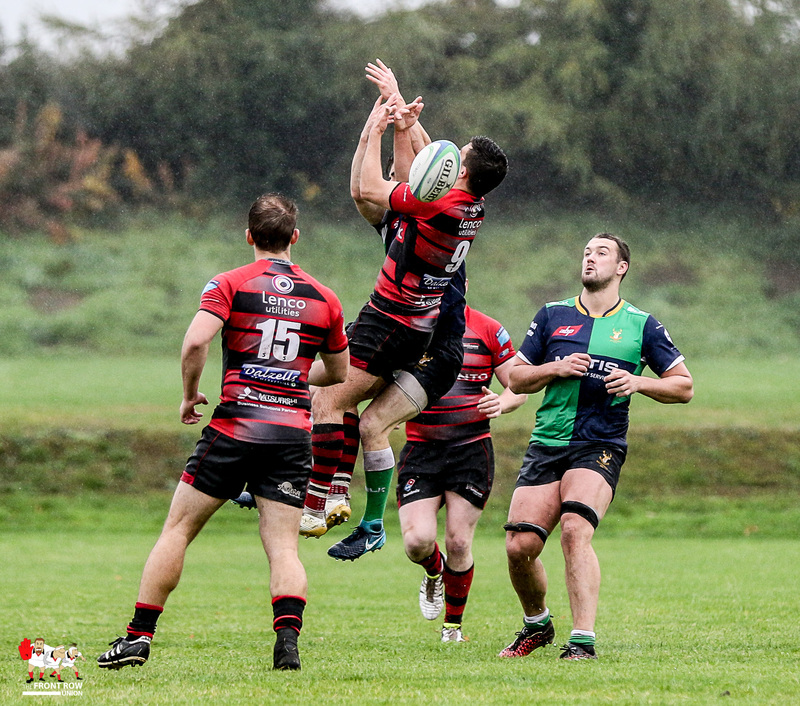 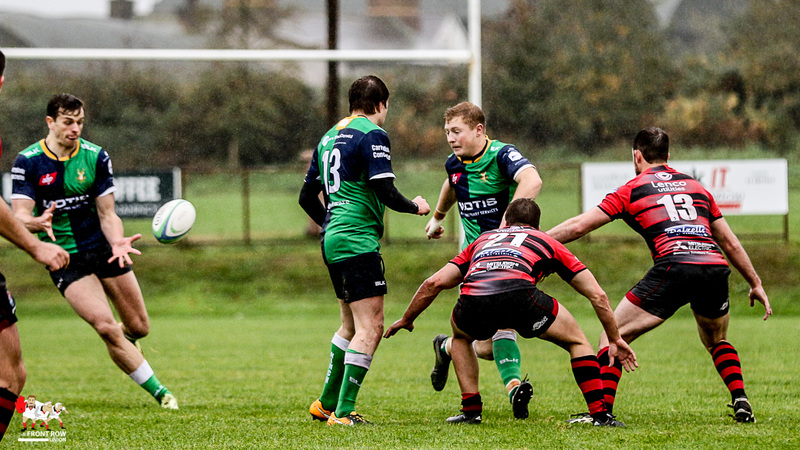 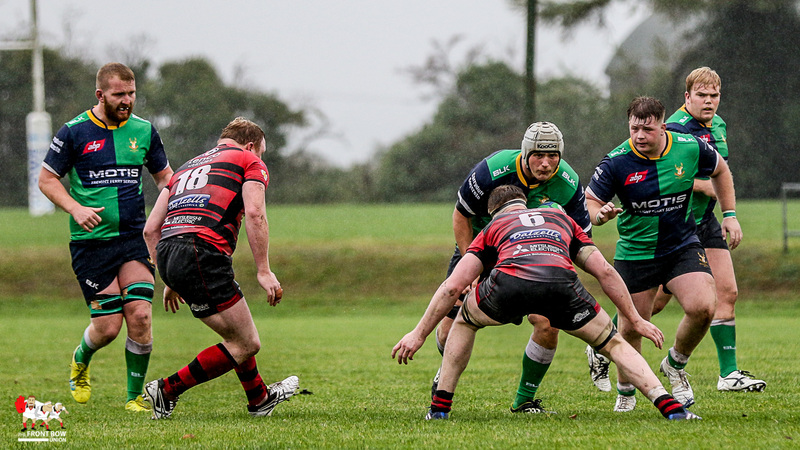 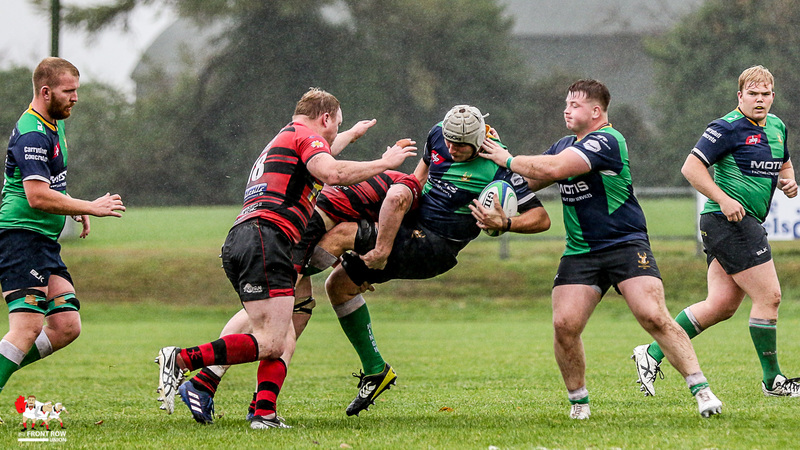 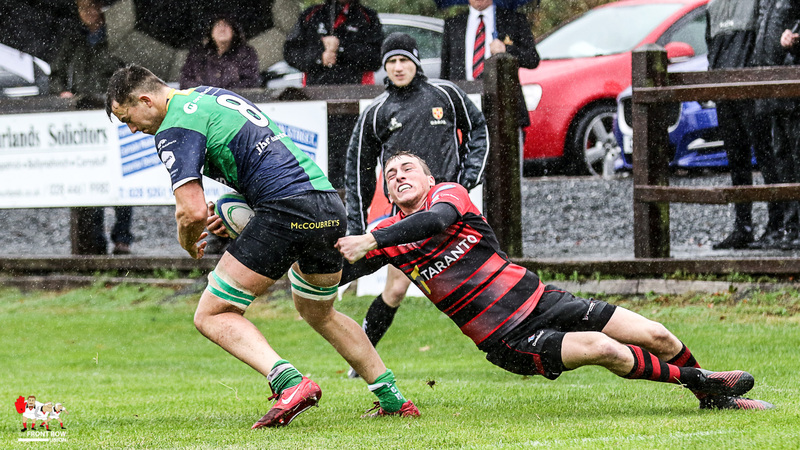 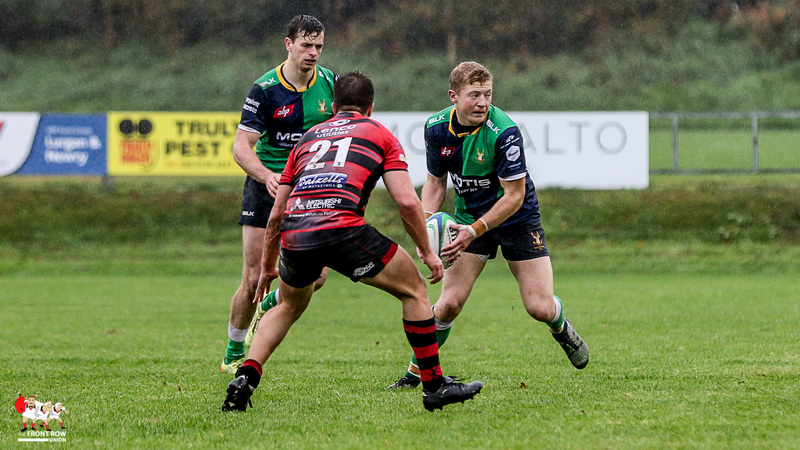 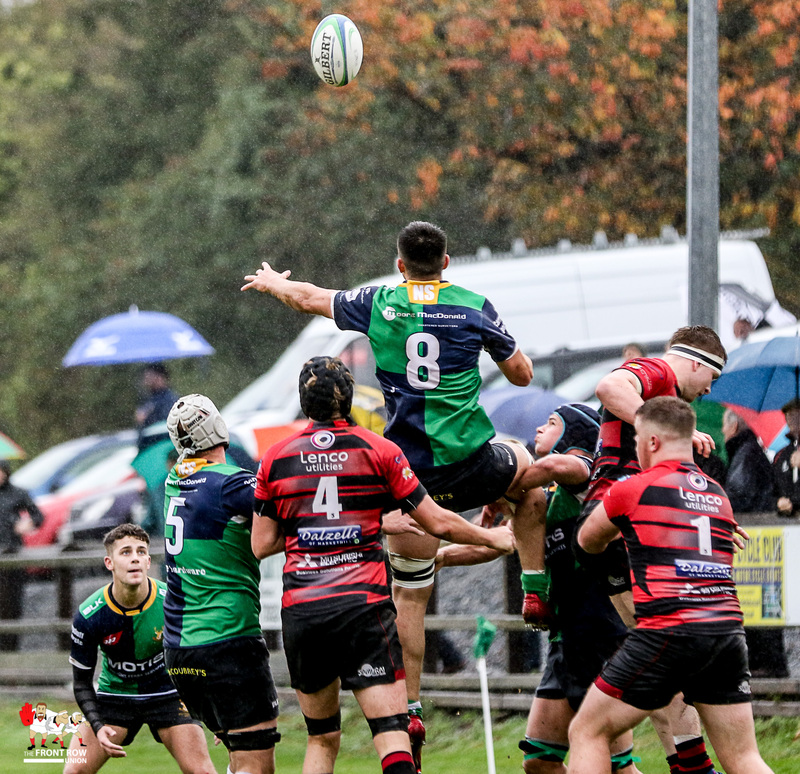 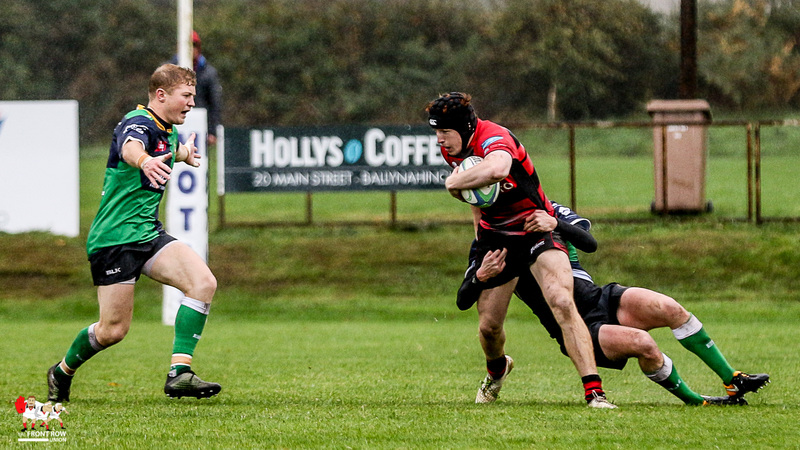 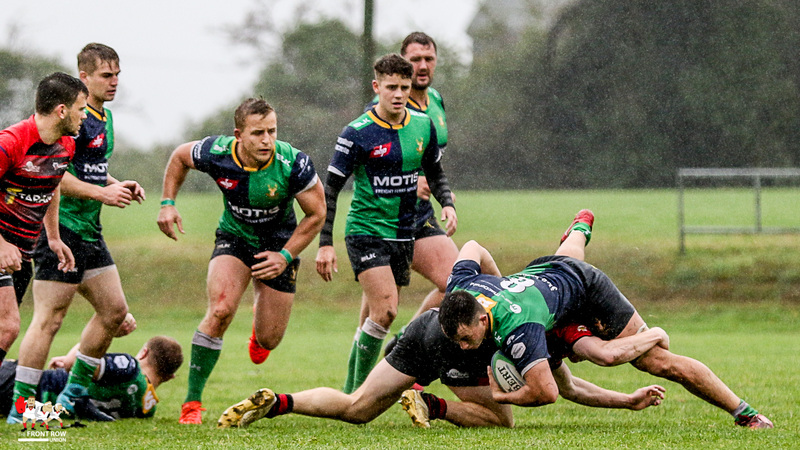 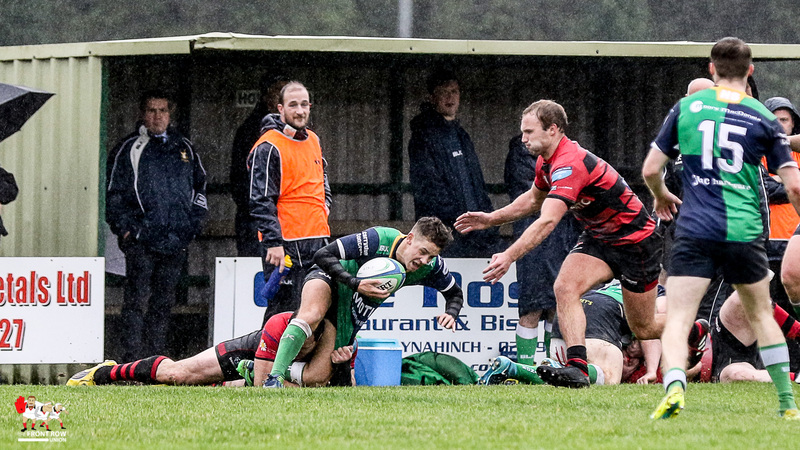 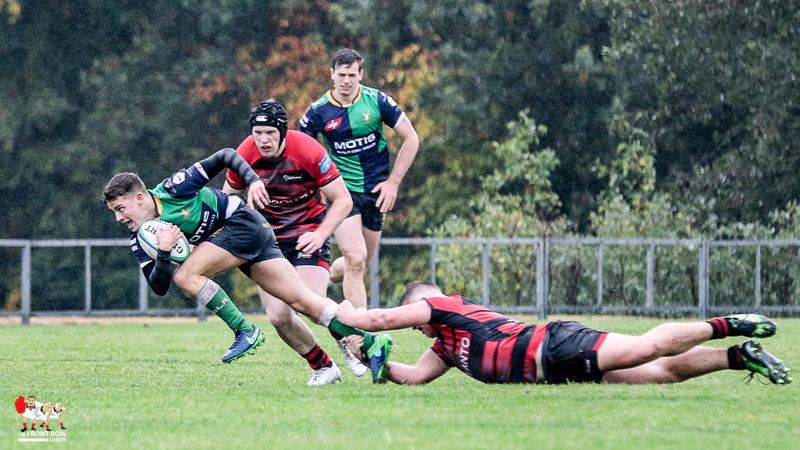 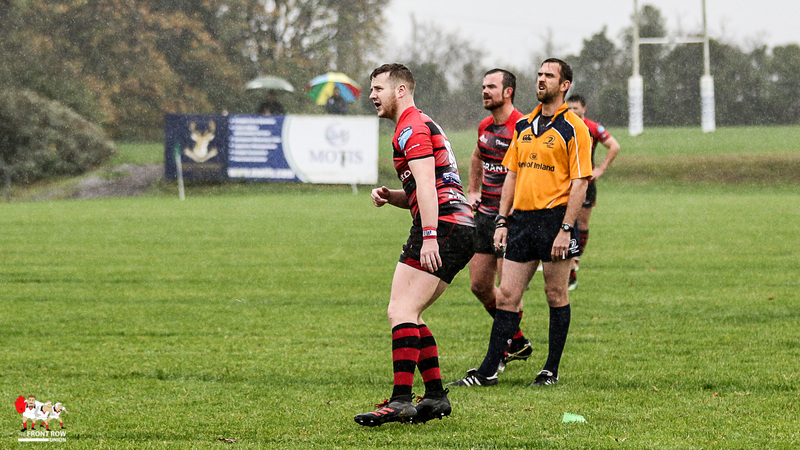 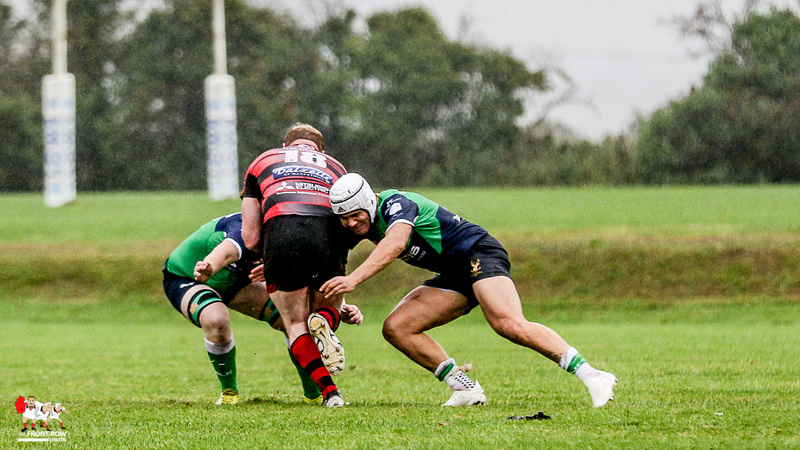 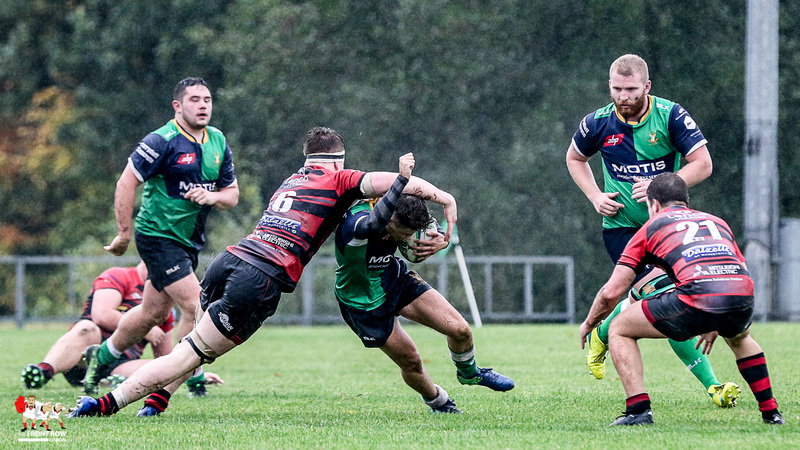 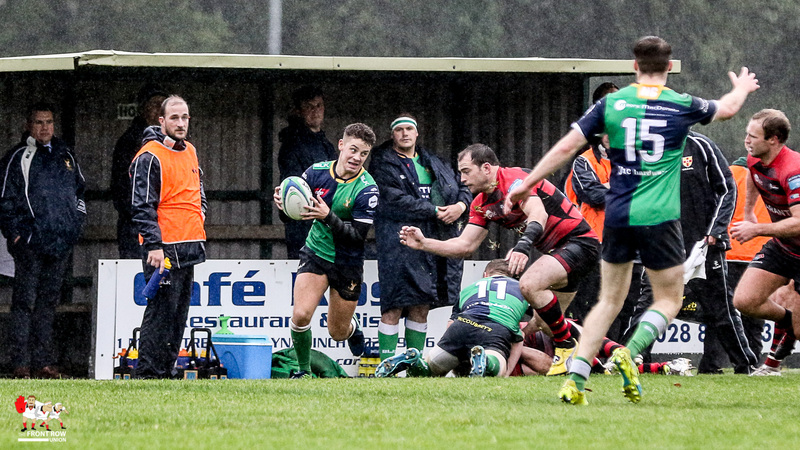 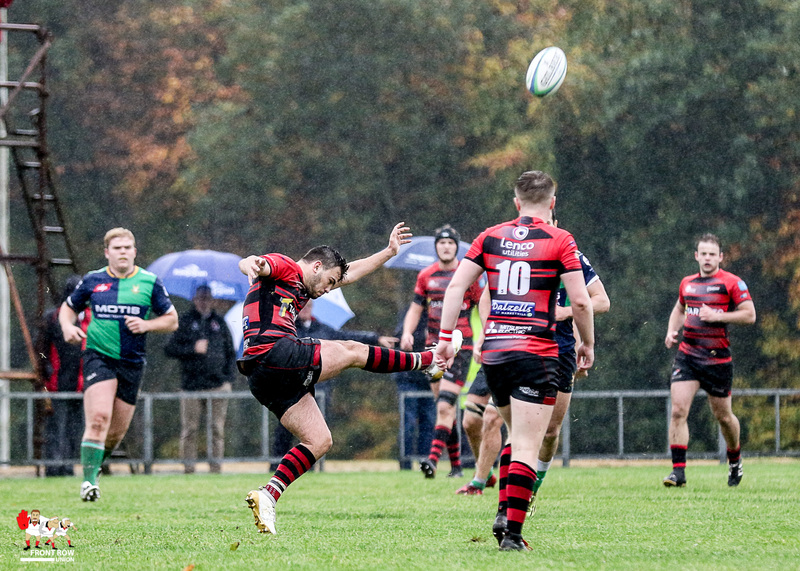 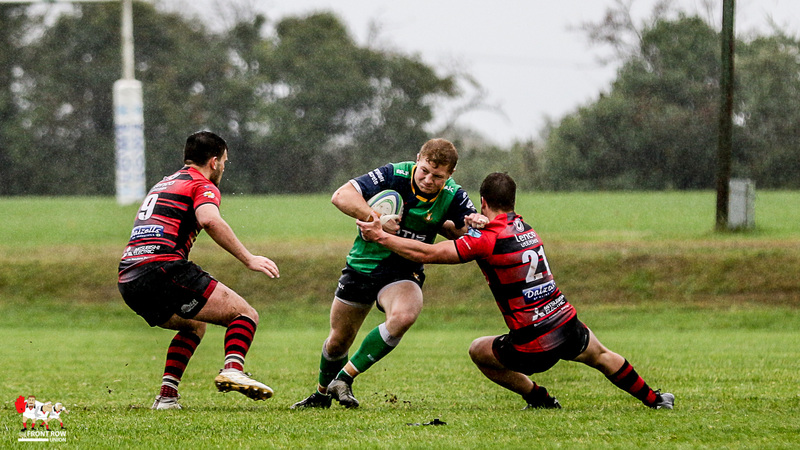 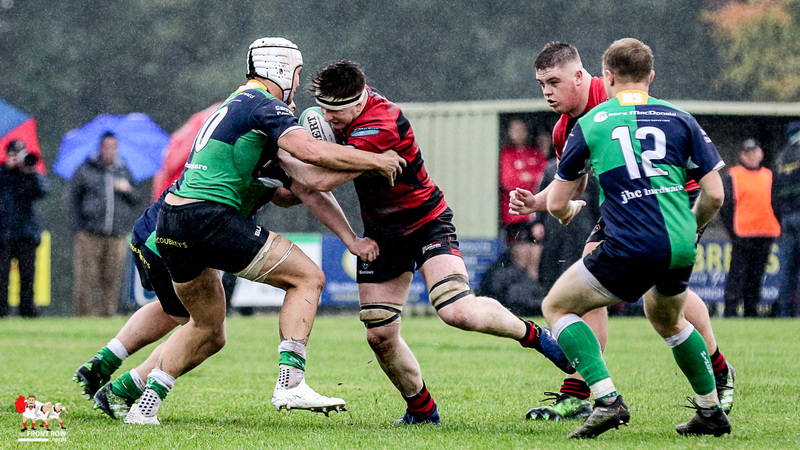 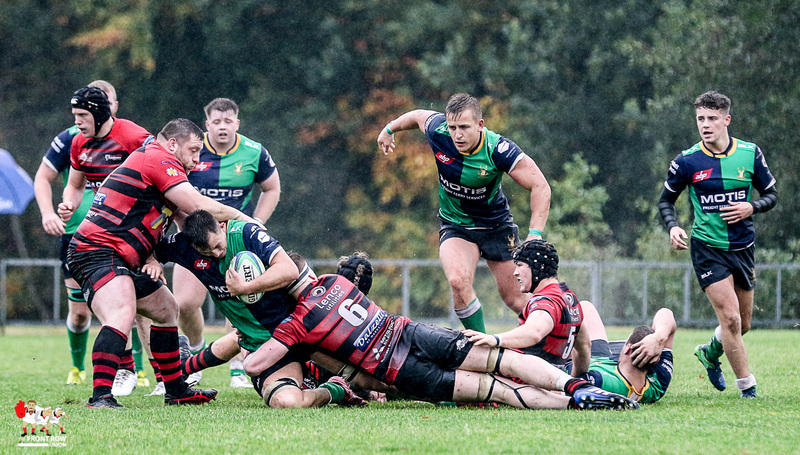 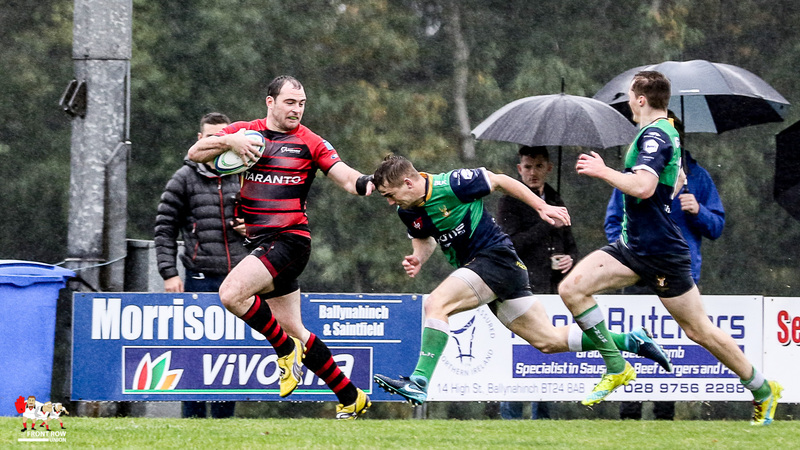 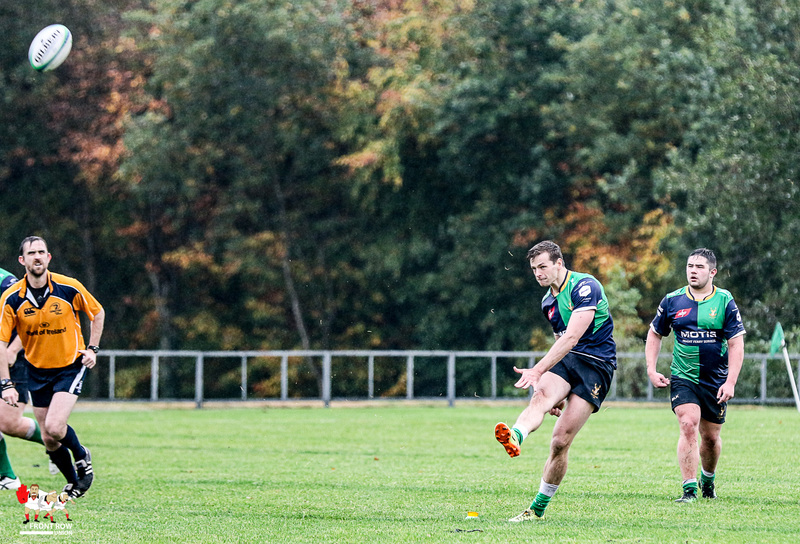 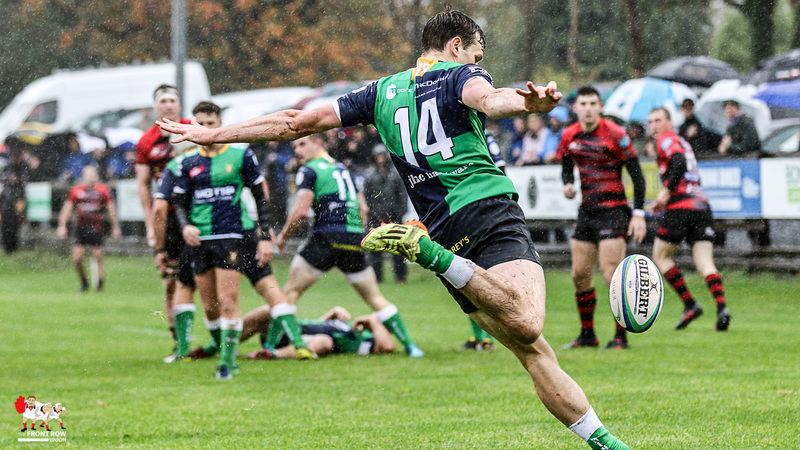 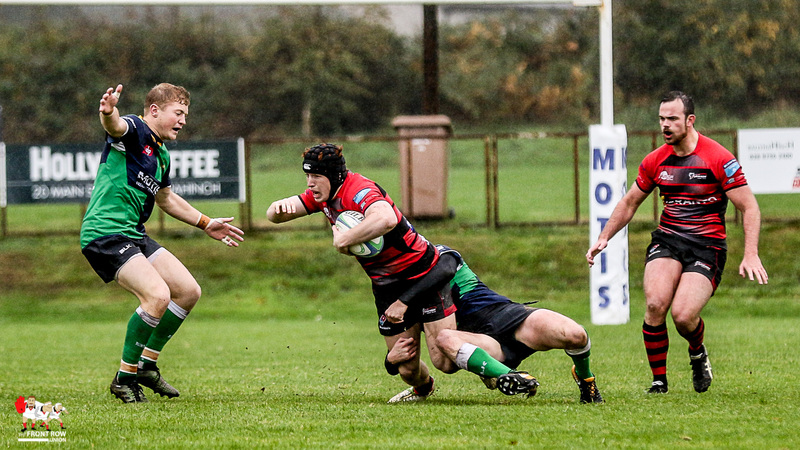 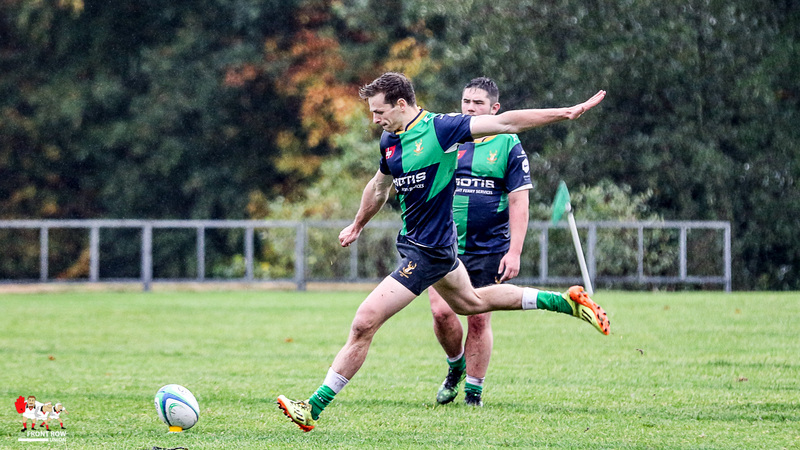 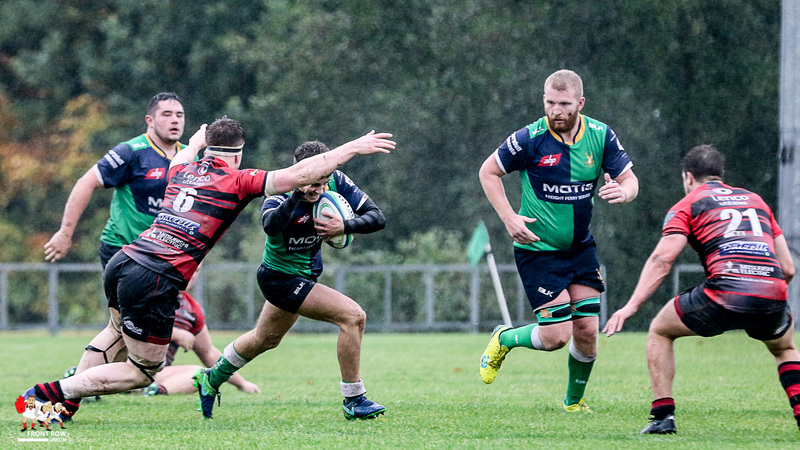 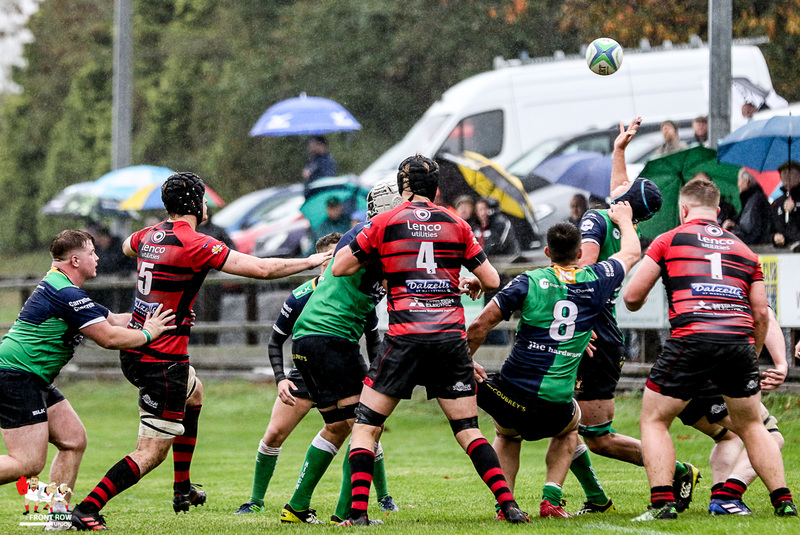 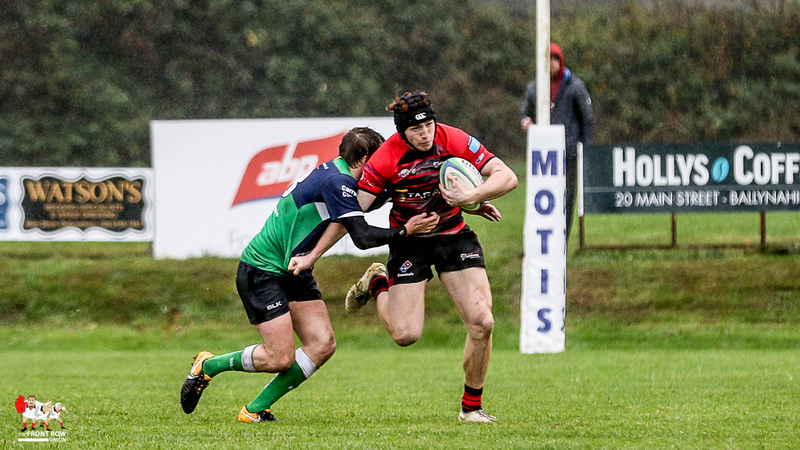 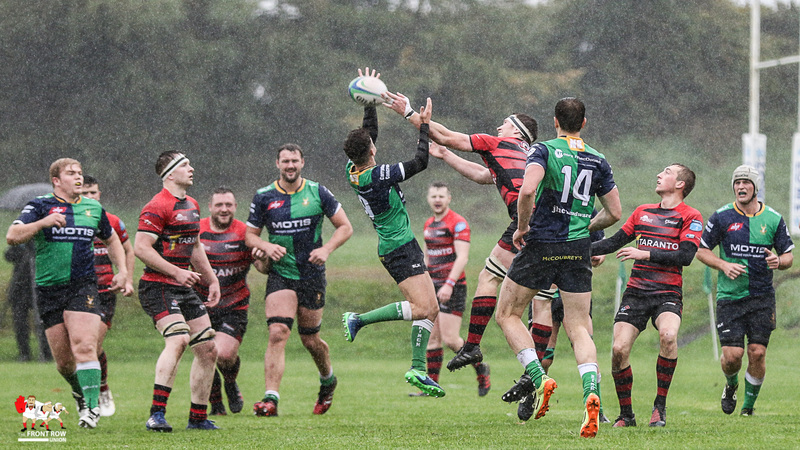 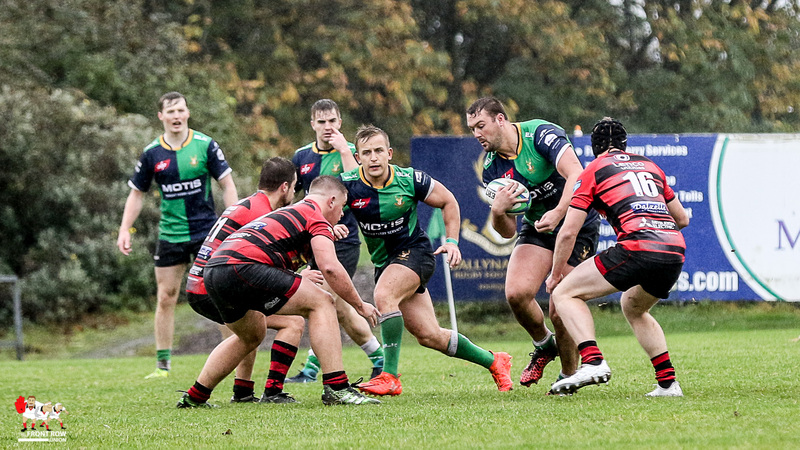 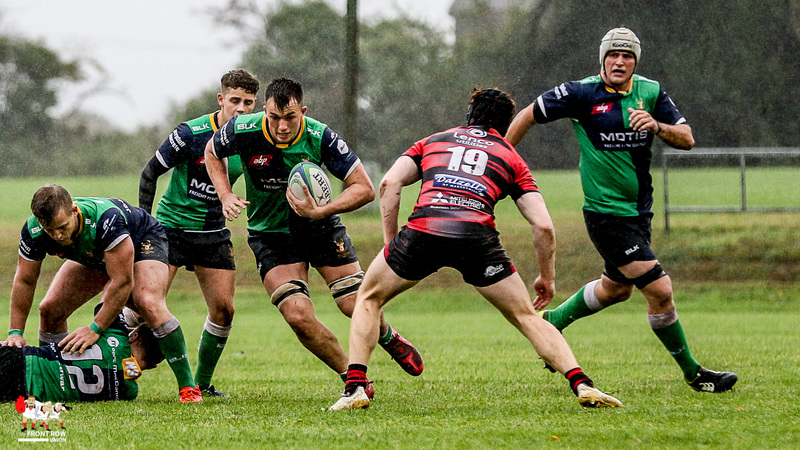 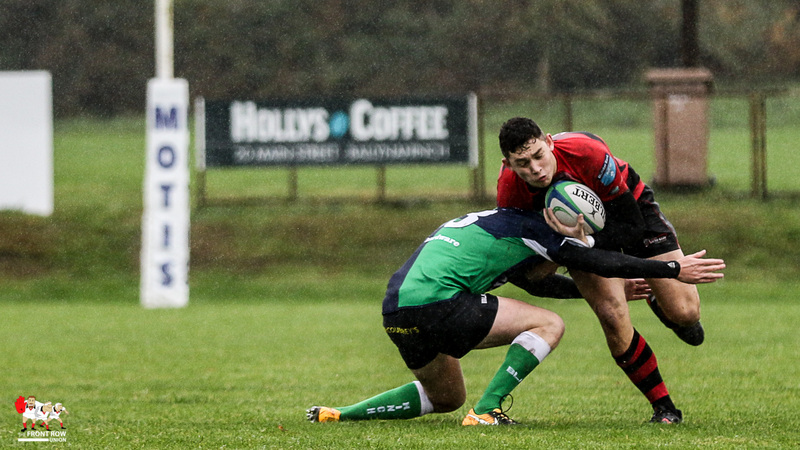 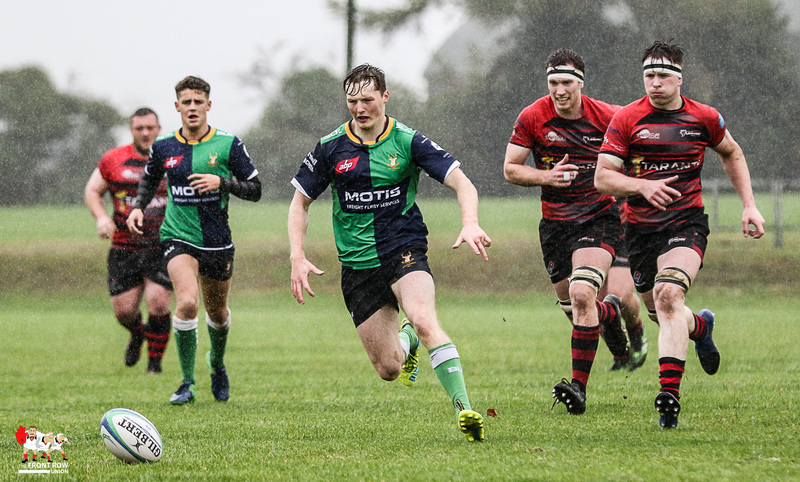 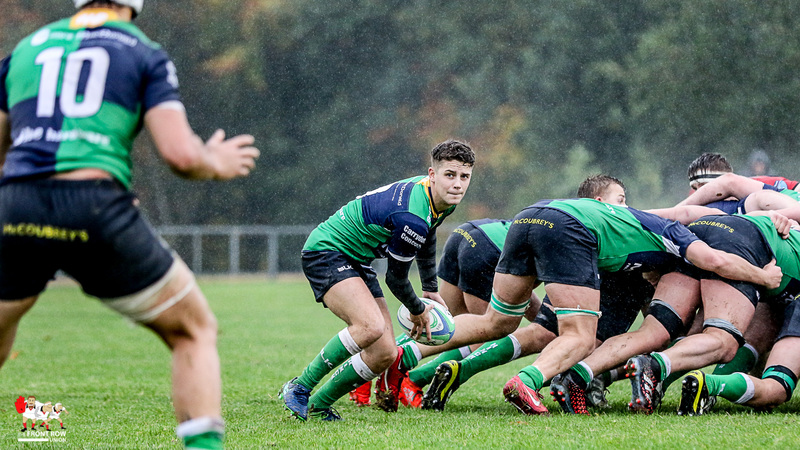 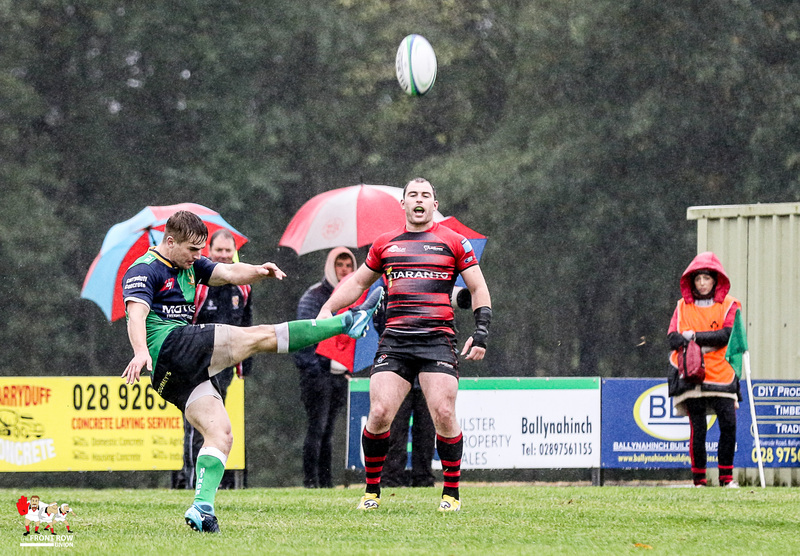 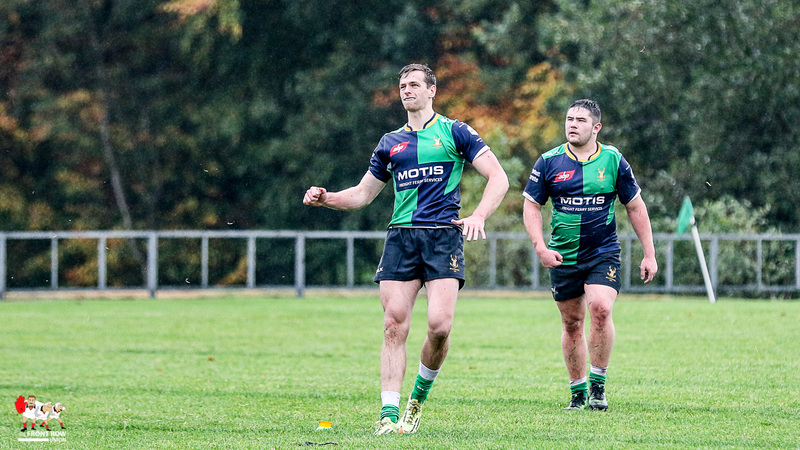 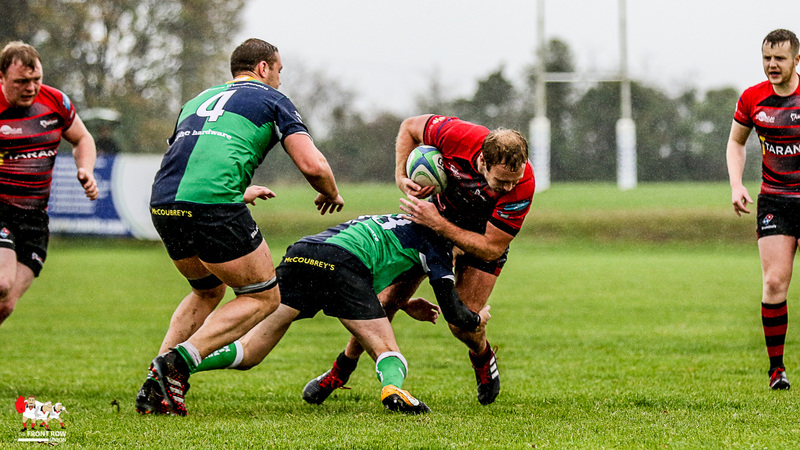 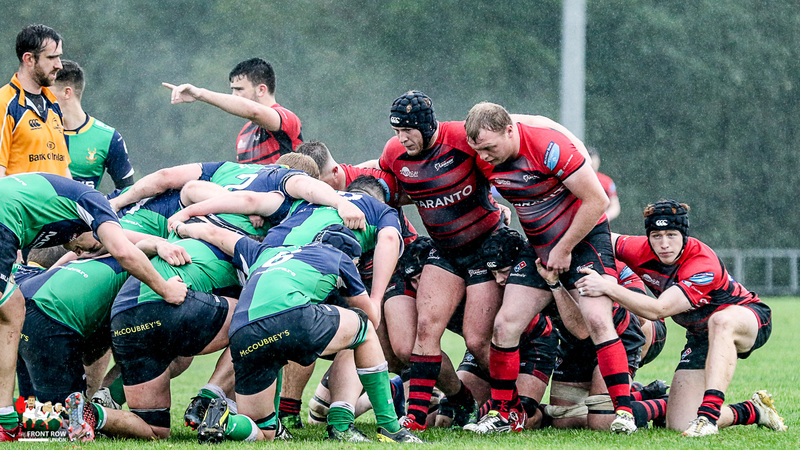 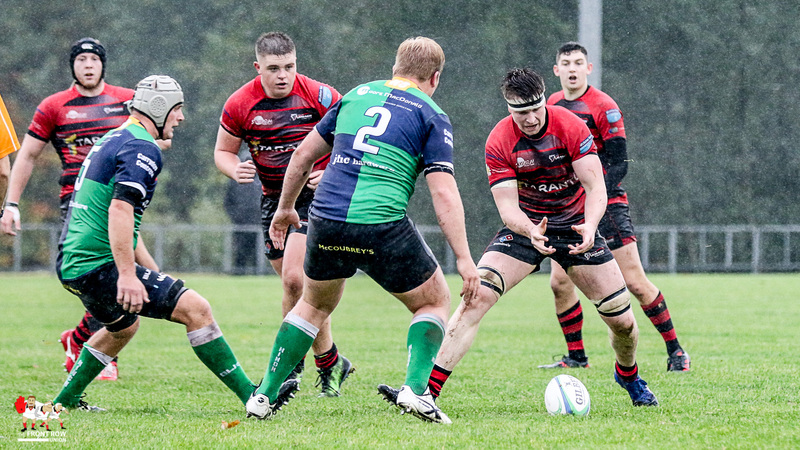 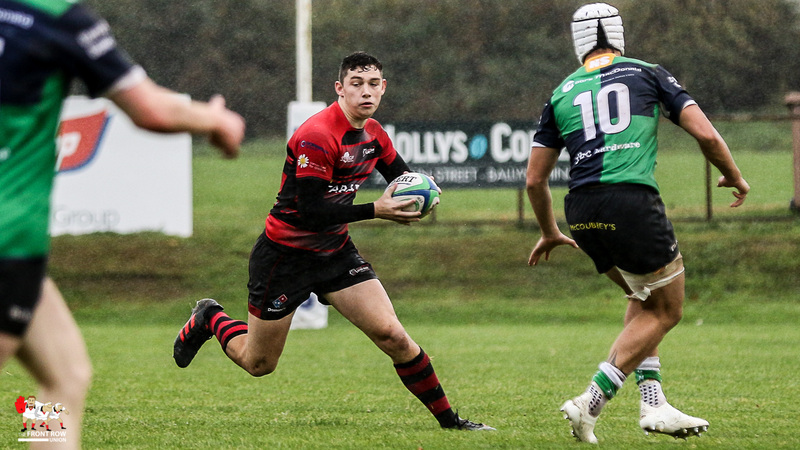 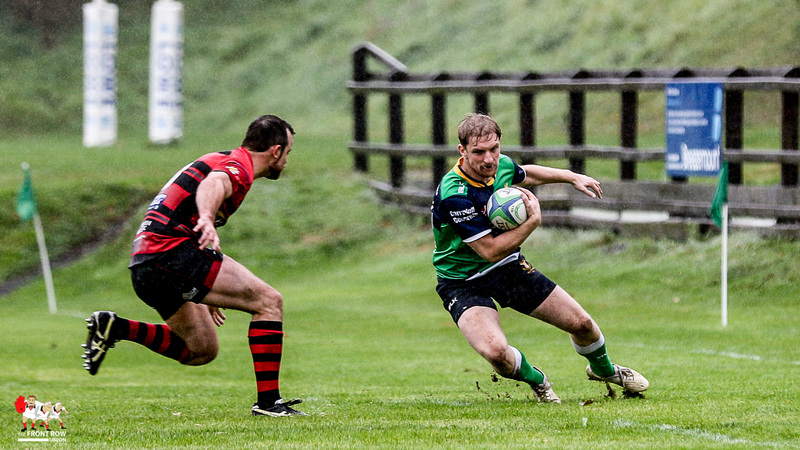 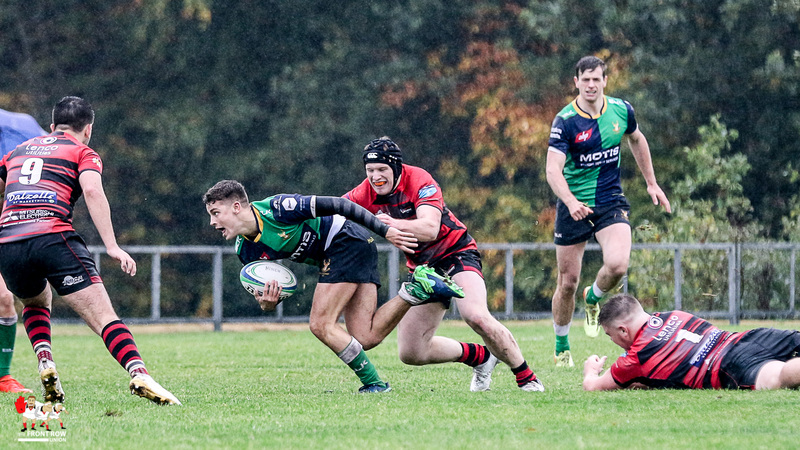 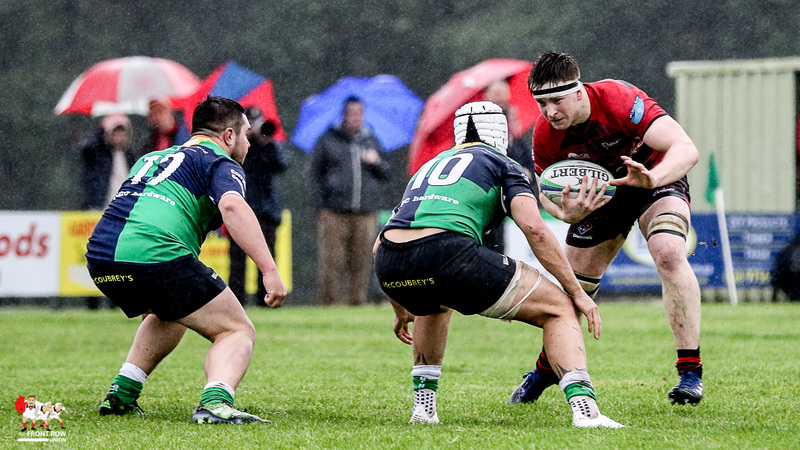 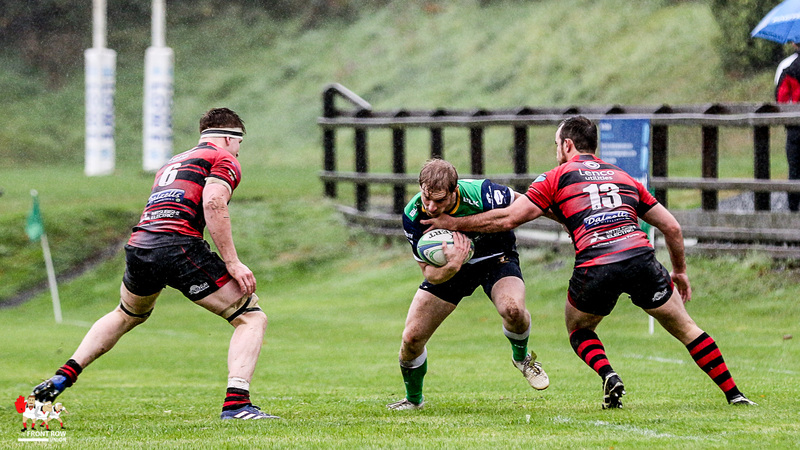 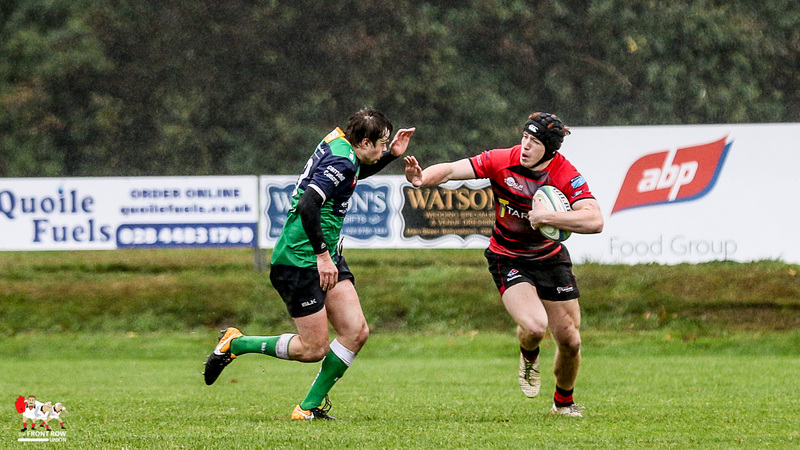 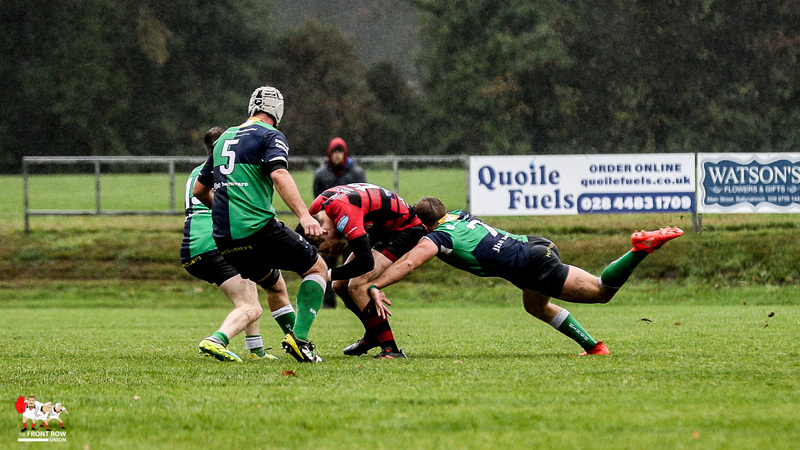 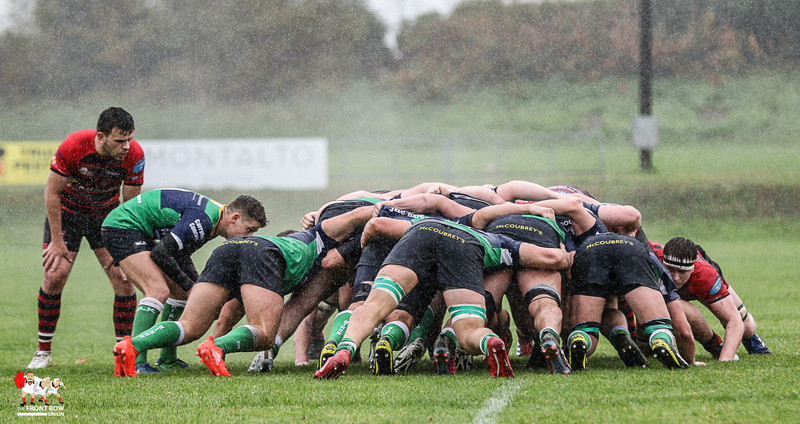 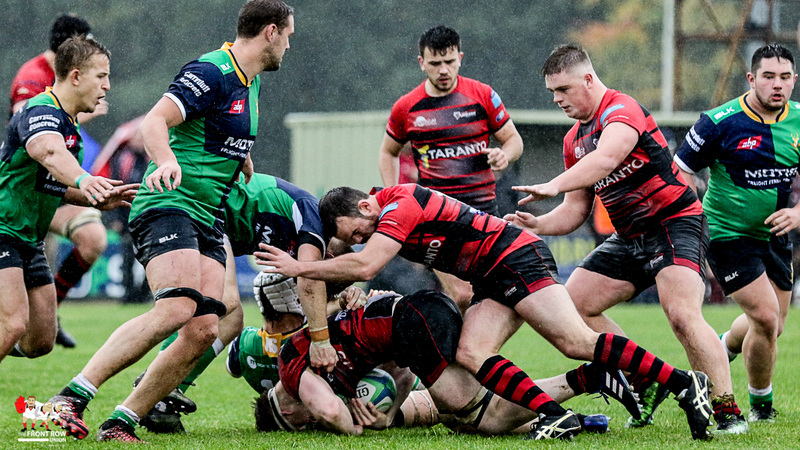 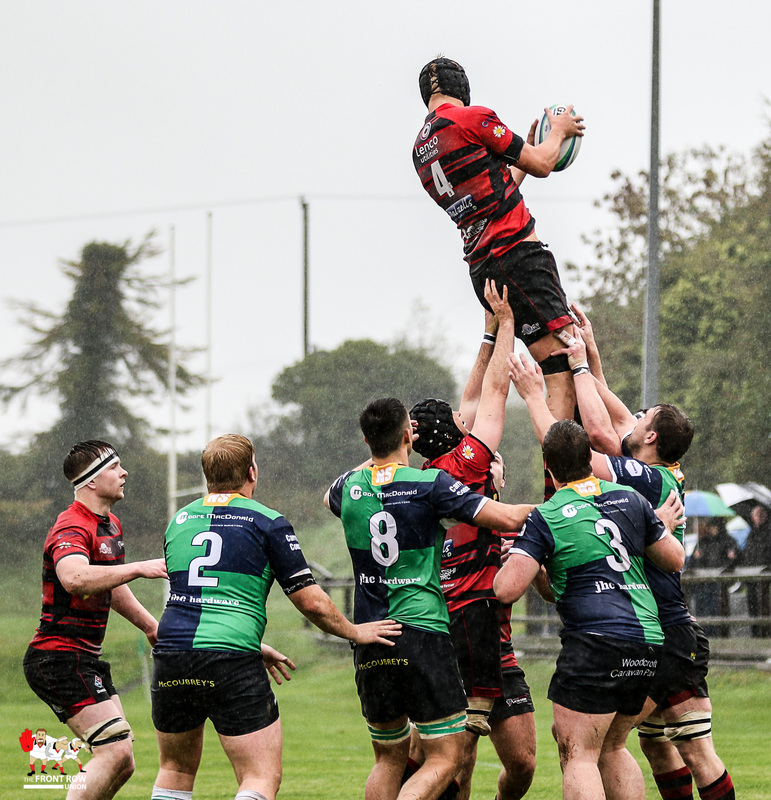 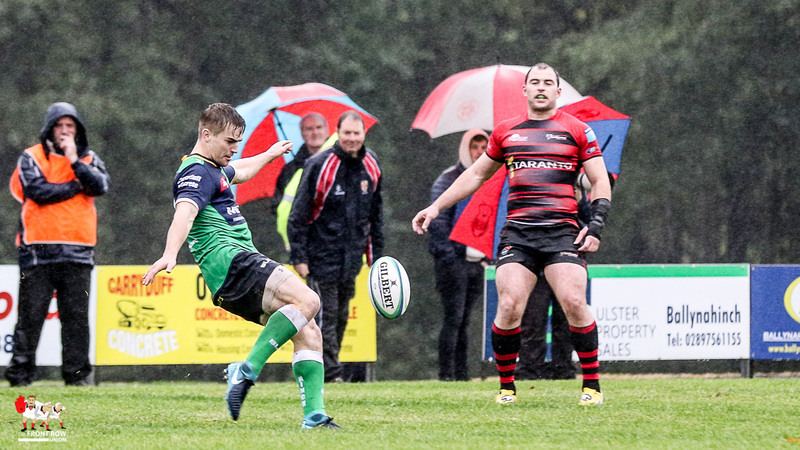 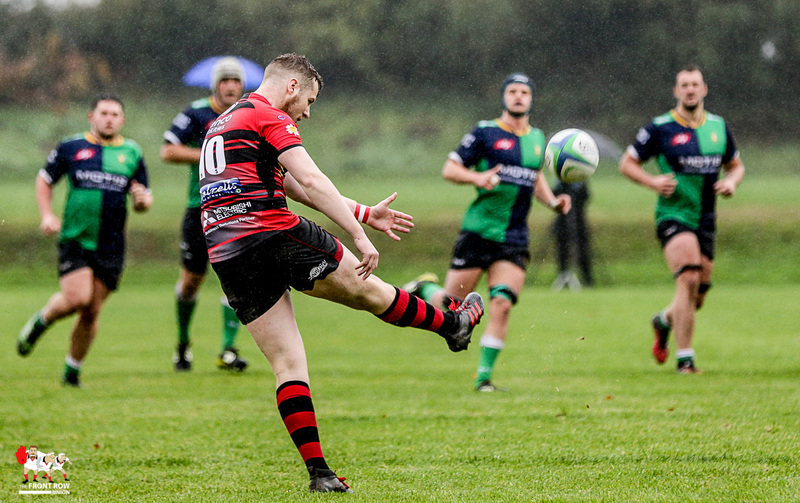 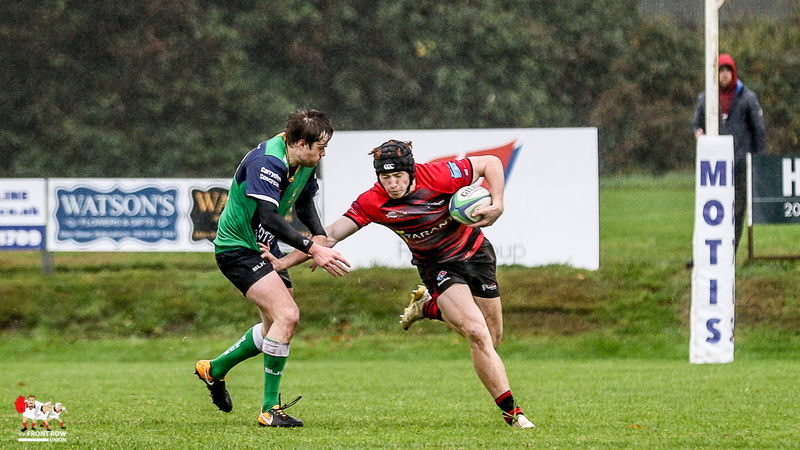 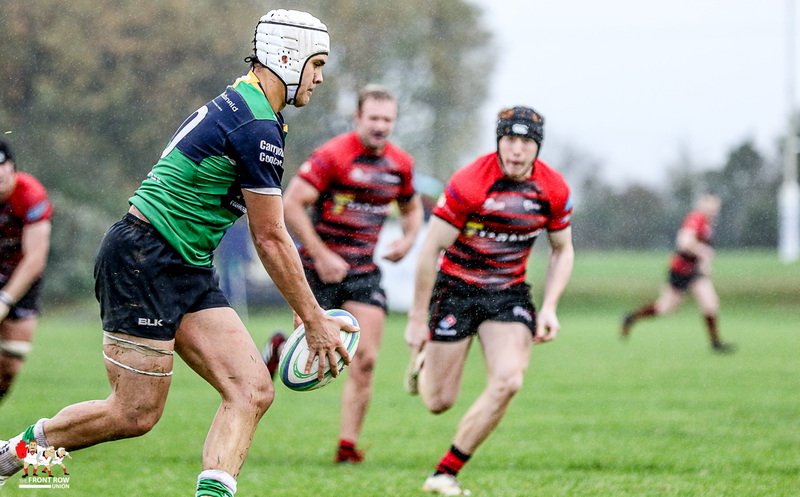 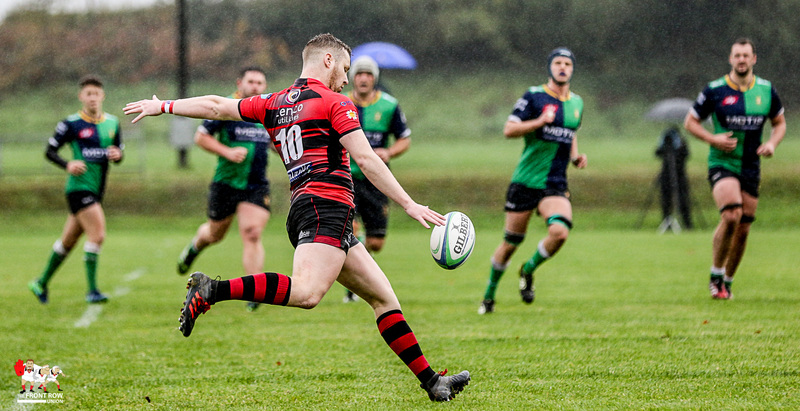 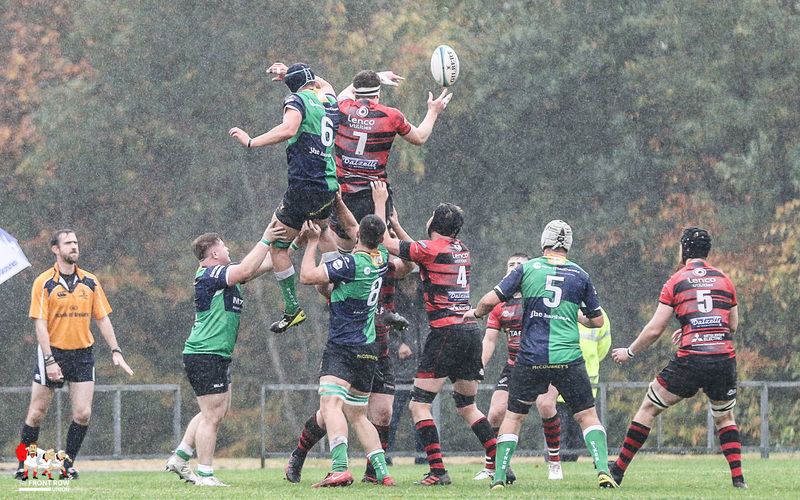 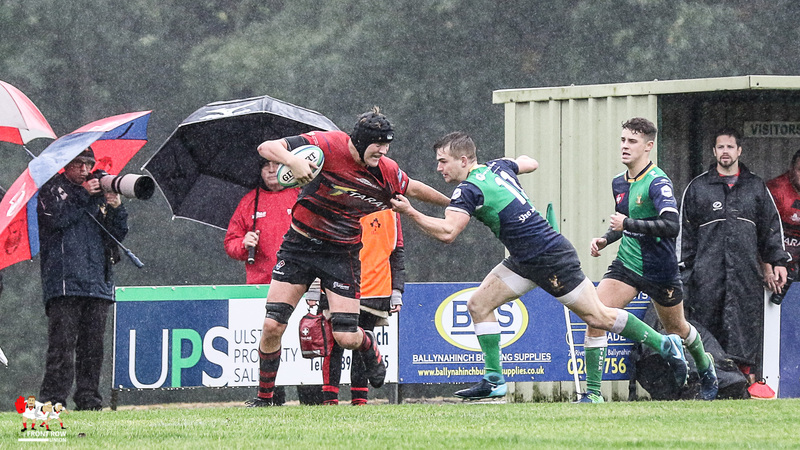 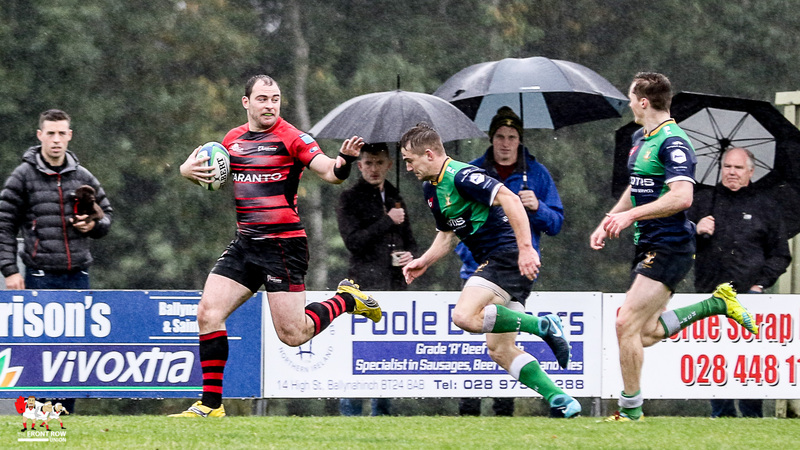 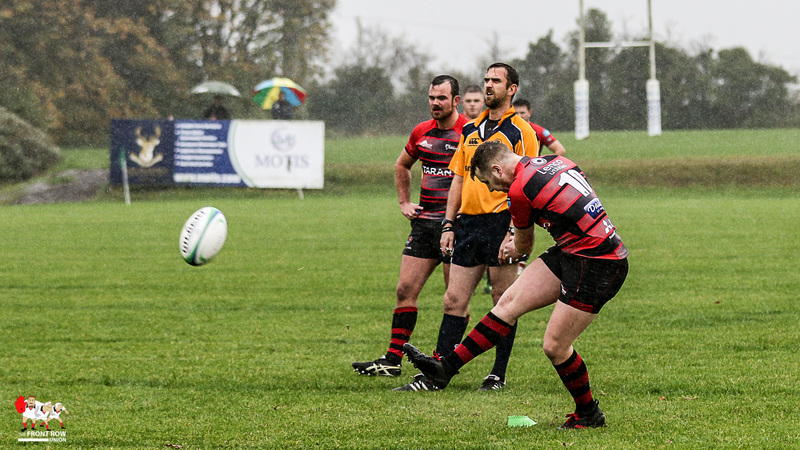 Ballynahinch and City of Armagh battled out a 3 – 3 draw at Ballymacarn Park on a wet Saturday afternoon in the second week of the All Ireland League 1B. 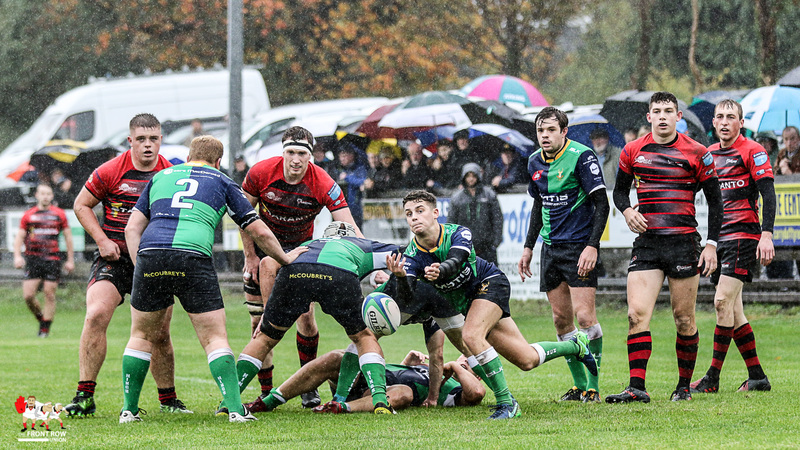 It was a game low on thrills but with plenty of spills as both sides found the incessant rain a hindrance to open play. 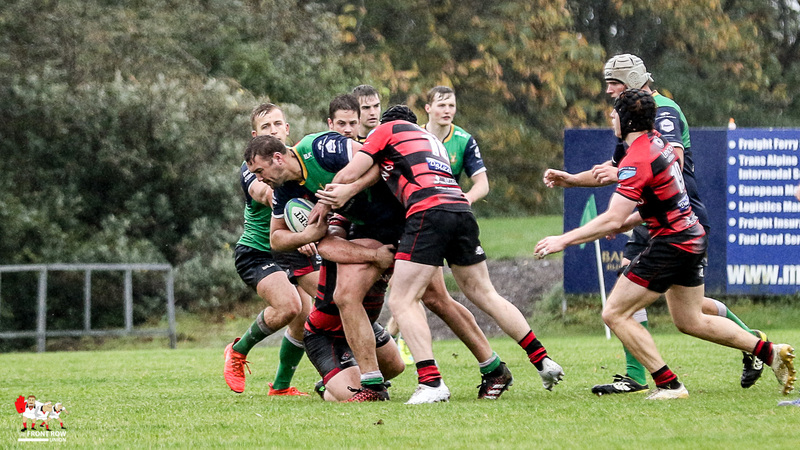 Neither side seemed prepared to open up which resulted in a defensive arm wrestle in the middle of the park with Armagh just about edging territory and possession. 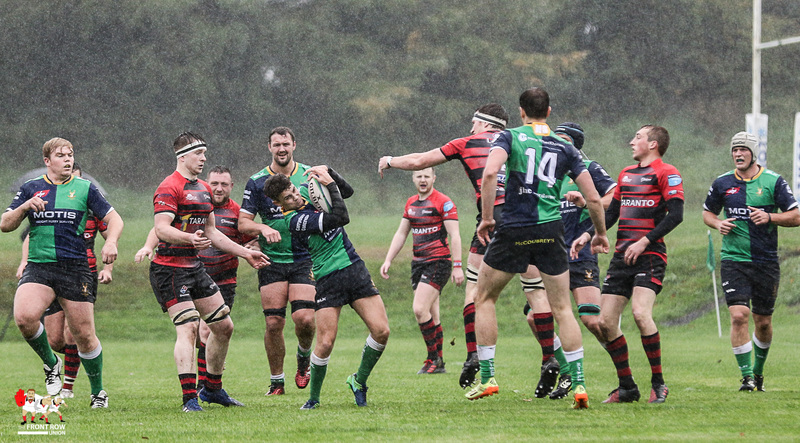 Despite the conditions and the safety first approach, from both sides, the game did rattle along at a reasonable pace but i don’t think I’ve covered a game where the ball was kicked away so often, the main form of attack being to kick the ball into the opponent’s half and hope for a mistake. 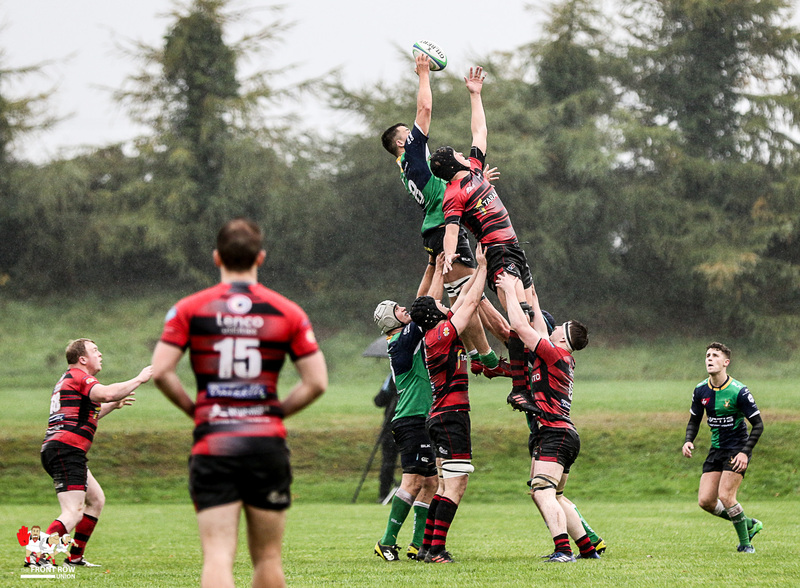 This did occasionally yield a result but the defences were generally too well drilled and/or the handling conditions too difficult for any meaningful attacks to develop. 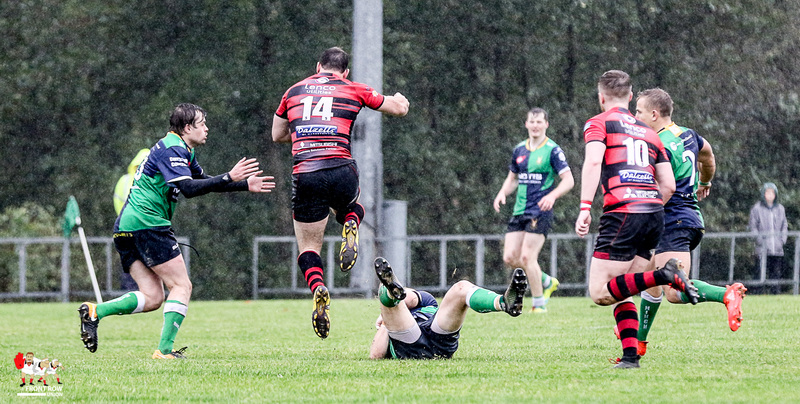 City of Armagh opened the scoring on the 6th minute with a penalty from Cormac Fox and it looked like that was going to be enough until Richard Reaney stepped up to tie the match with the last kick of the game. 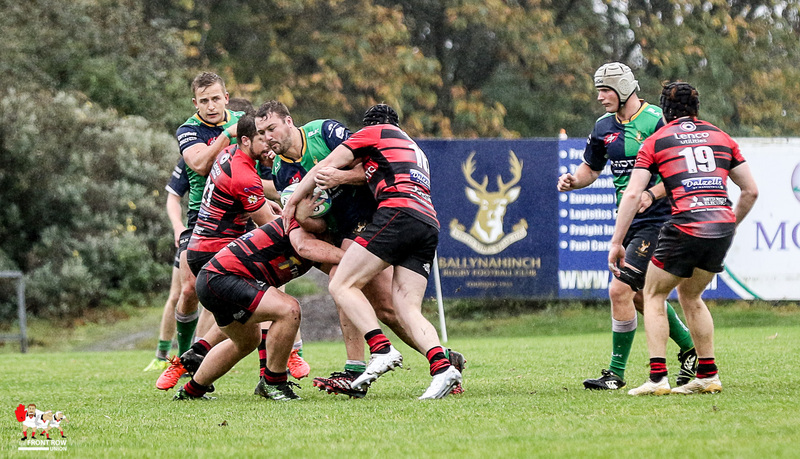 BALLYNAHINCH: Conor Kelly, Richard Reaney, Callum McLaughlin, Ryan Wilson, Aaron Cairns (c), Hilton Gibbons, Rhys O’Donnell, Ben Cullen, Conor Piper, Kelvin Hamilton, James Simpson, Keith Dickson, Tom Martin, Ollie Loughead, Conall Boomer. 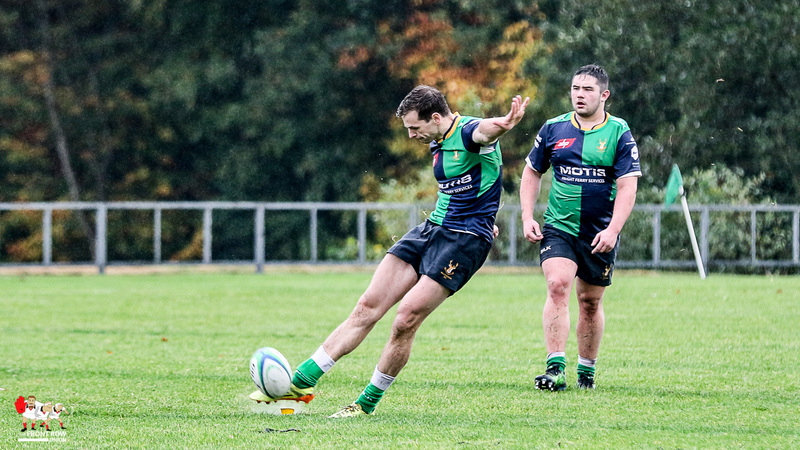 Replacements: Jonny Blair, Graham McKittrick, Matt Connolly, Gareth Gill, Ronan Patterson. 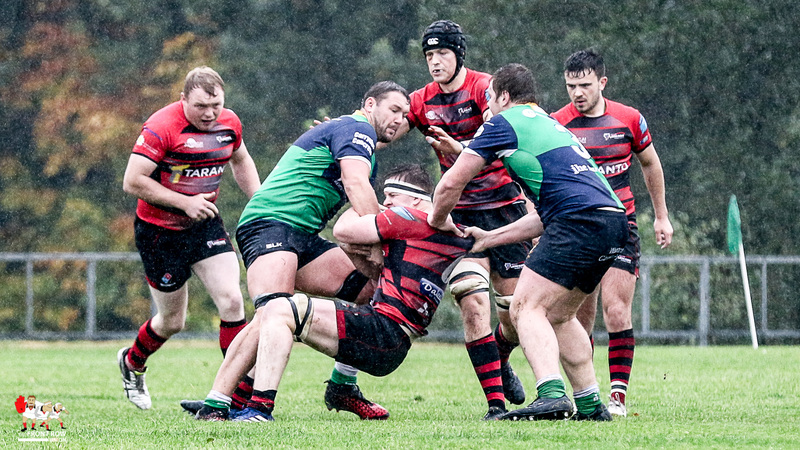 CITY OF ARMAGH: Chris Cousens, Andrew Willis, Chris Colvin (c), Evin Crummie, Ryan Purvis, Cormac Fox, Gerrard Treanor; Paul Mullen, Andrew Smyth, Phillip Fletcher, Josh McKinley, Peter Starrett, Robbie Whitten, Nigel Simpson, Neil Faloon. 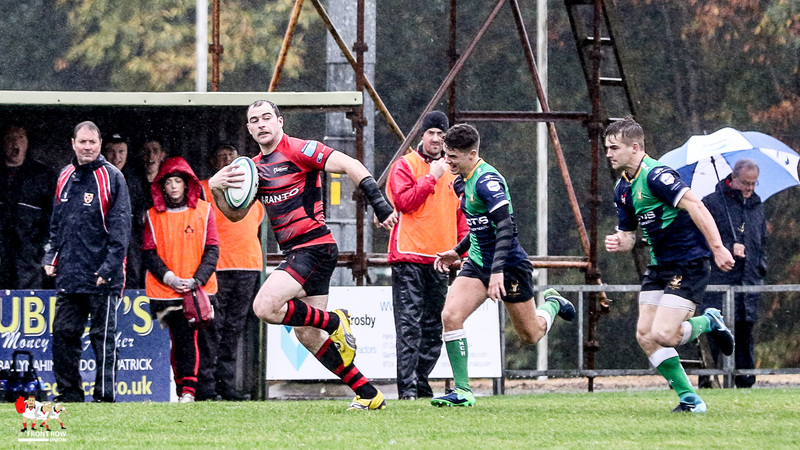 Replacements: Jonathan Morton, Daryl Morton, James Hanna, Johnny Pollock, Tim McNiece.